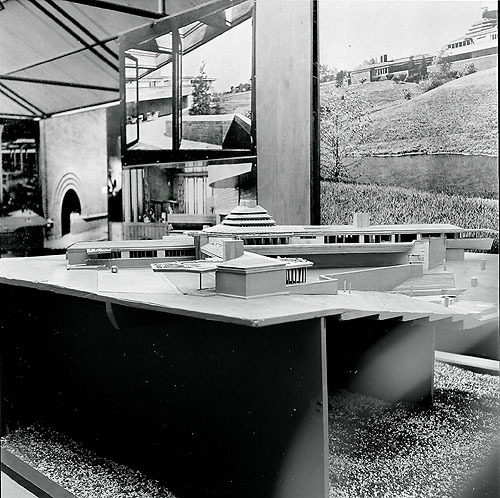 "Sixty Years of Living Architecture: The Work of Frank Lloyd Wright" was a traveling exhibition of Wright's work, consisting of Models, photographs and original drawings. 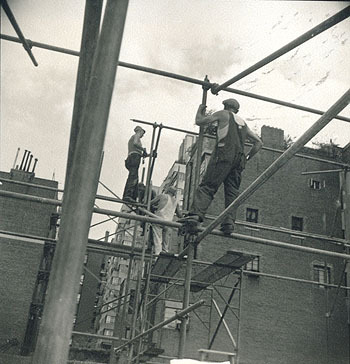 A Preview of the exhibition was held in Philadelphia at Gimbel Brothers Gallery in January, 1951. The world wide tour opened in Palazzo Strozzi Florence, Italy (June 1951). 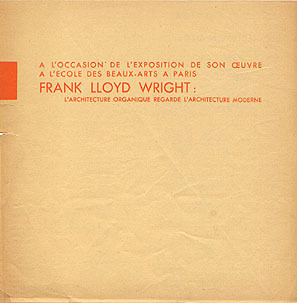 In "Sixty Years" (New York), Wright notes that from Florence the Exhibition traveled to "Switzerland, France, German and Holland". The Exhibition catalogs are dated: Paris (April 1952), Zurich (End of May 1952), Munich (May 16 - June 15, 1952), and Rotterdam (dated June 1, 1952). 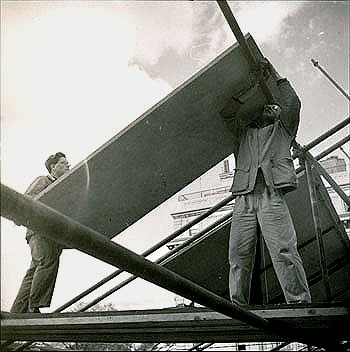 After two years in Europe the exhibition crossed the Atlantic to Mexico City, then to New York (1953). 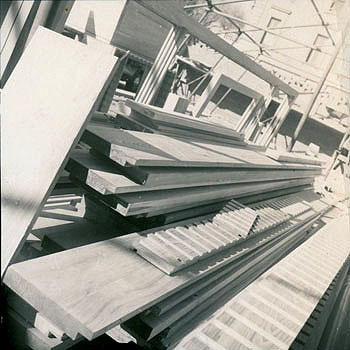 After an exhibition in Los Angeles (1954) Wright indicates (LA) that the Exhibition was headed to the Orient. Manila, Tokyo and New Delhi in 1955. Note: We found no evidence that the Orient exhibitions took place. 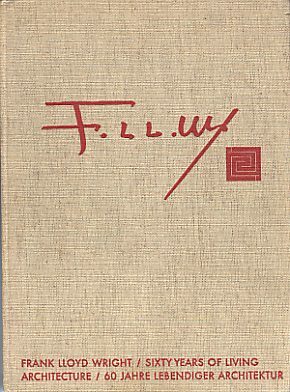 In "Frank Lloyd Wright, His Life, His Work, His Words" pp. 219-220, Mrs. Wright indicates that after the Exhibition in LA, "...it returned to Taliesin". 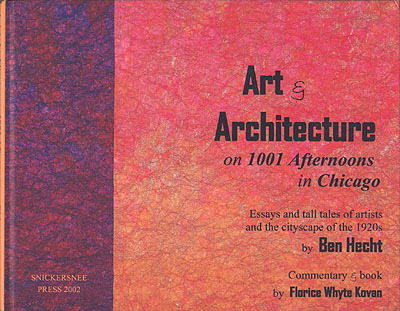 Also of interest is the booklet that was published for the Exhibition held in Chicago. Included in the title of the booklet is "Series Nine Chicago". When you count the number of exhibitions, eliminating the Orient, Chicago is number nine. 1) Florence 2) Switzerland 3) France 4) German 5) Holland 6) Mexico City 7) New York 8) Los Angeles 9) Chicago. The exhibition catalog is dated October 16, 17, 18, 1956. Mayor Daley proclaimed October 17, Frank Lloyd Wright Day. 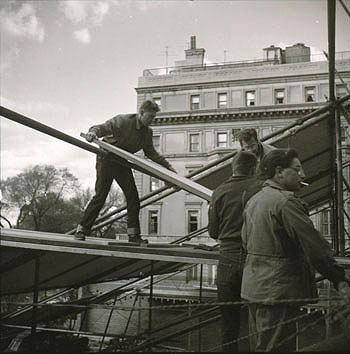 The exhibition in New York (1953) took place on the grounds that would eventually become the Guggenheim Museum. 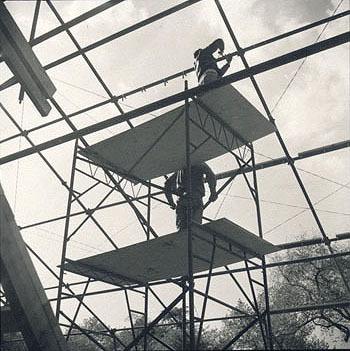 The complex that was constructed for the Exhibition consisted of two structures. 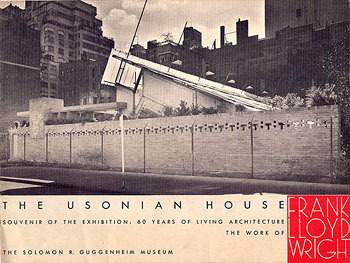 The New York Usonian Exhibition House (S.369) and the Pavilion (S.370), both seen on the cover of the catalog below. 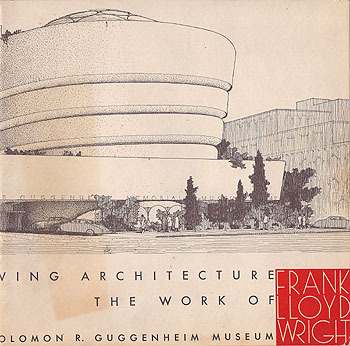 "Sixty Years of Living Architecture: The Work of Frank Lloyd Wright". 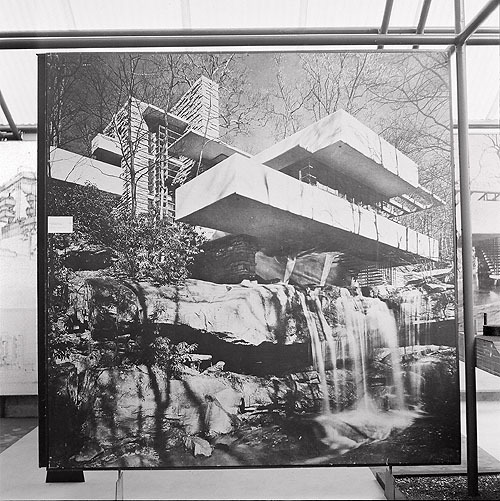 The New York House and Pavilion were constructed at the same time. 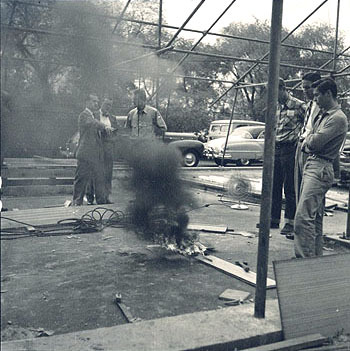 According to the October issue of Art News, the exhibition was held from October 9 - November 15, 1953, but a more accurate ending date was November 29, 1953. Two booklets were produced. One for the House (below) and one for the Exhibition. The exhibition included a fully furnished 1,700 sq. 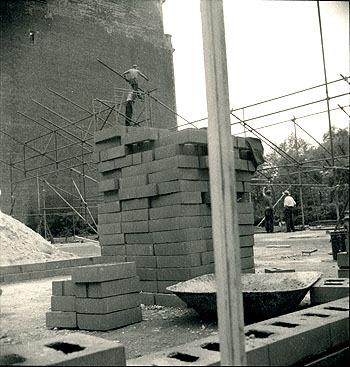 ft. ''Usonian House''. 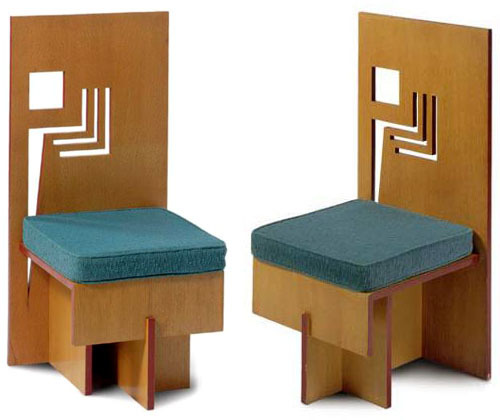 Wright used the same design for the dining chair in other homes including Trier Residence (S.398). 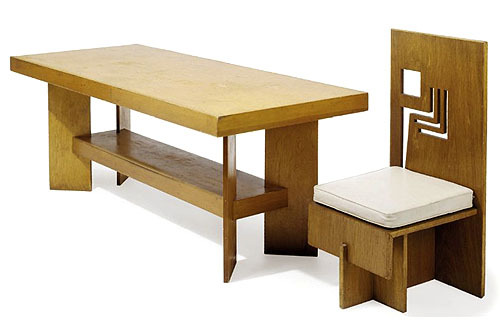 On occasion, furniture from the exhibition are offered at auction houses. 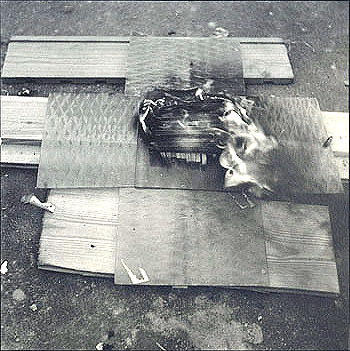 After the exhibition in New York, the house was auctioned off. 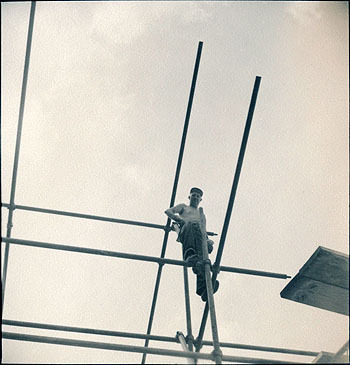 The buyer contracted polio and was unable to reconstruct the home. In 1984, after sitting in storage for 30 years, it was put up for auction again. Tom Monaghan won the bid at $117,000. 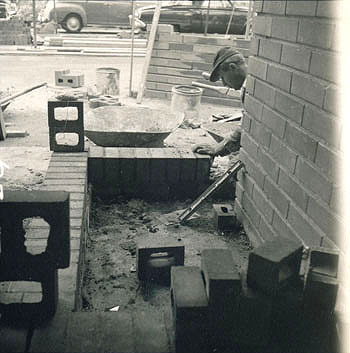 Plans were made to reconstruct the home, but time had taken its toll. Parts were eventually auctioned off again in 1992. 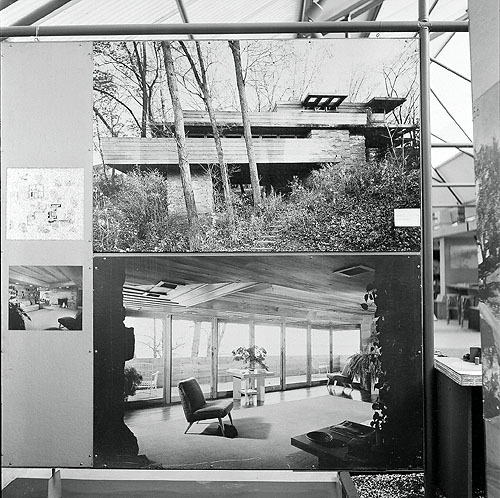 After the New York Exhibition, the first home to be built, based on the floor plan of the Usonian Exhibition House (S.369) was the Feiman Residence (S.371). The second home was the Trier Residence (S.398). 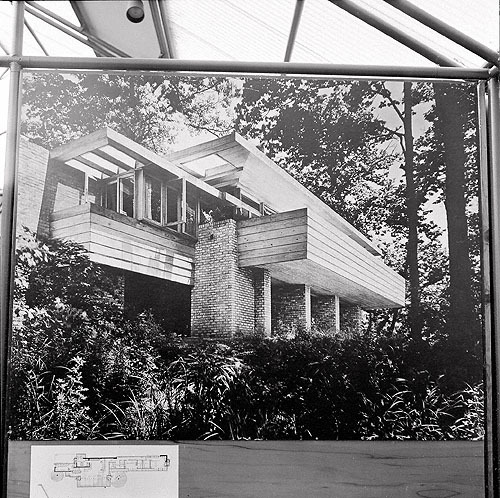 Wright's initial drawing of the home shows that he conceived the Trier Residence as a Usoniam Automatic, constructed of 12 x 24" concrete blocks. 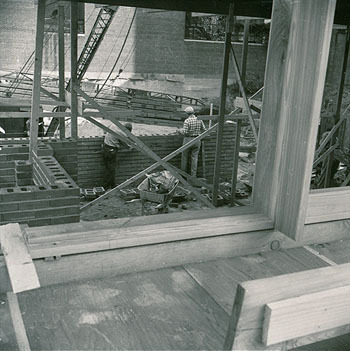 The working drawings specify the home to be constructed of brick. October 2010. Author: Wright, Frank Lloyd; Oud, J.J.P. 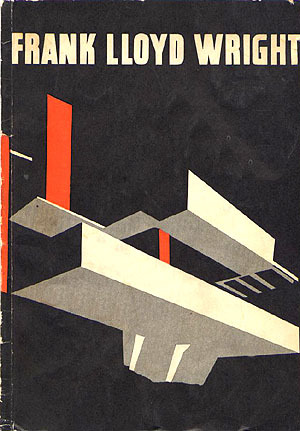 Title: PR: Sixty Years of Living Architecture (1953 - S.369, 370). 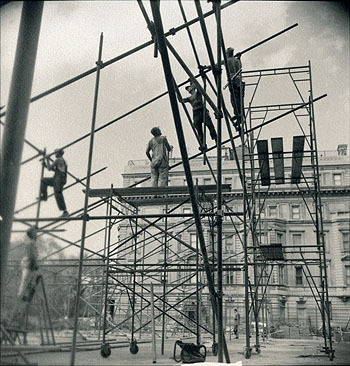 Description: The Solomon R. Guggenheim Foundation Press Release. October 20, 1953. 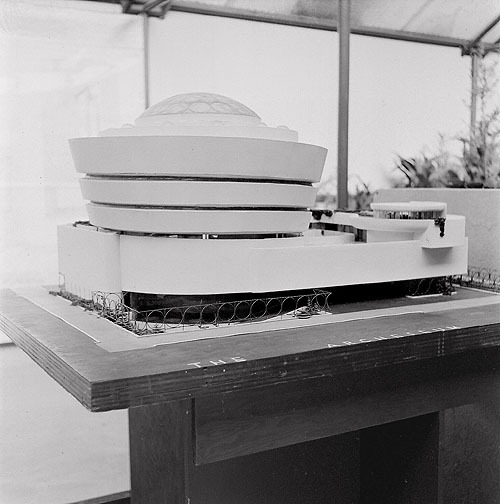 "The exhibition, Sixty Years of Living Architecture, the work of Frank Lloyd Wright will be opened to the public in the Solomon R. Guggenheim Museum on Thursday, October 22nd. 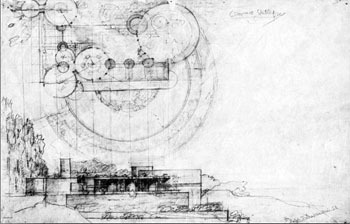 This will be the first comprehensive retrospective exhibition of Frank Lloyd Wright�s work of this scale to be held in New York and the most comprehensive ever held. 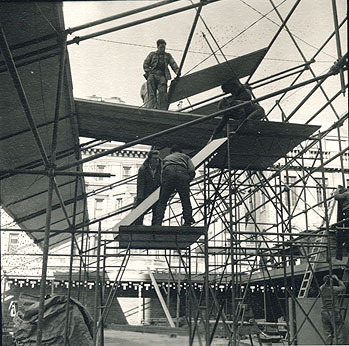 The temporary pavilion, which has been constructed for the exhibition on the plot of ground adjoining the present Museum, is the first building by Frank Lloyd Wright in New York City. 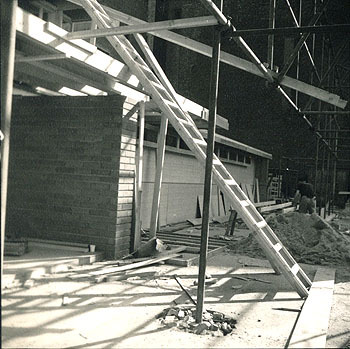 Title: New York Usonian Exhibition House and Pavilion Construction 1953 (1953 - S.369 & 370). 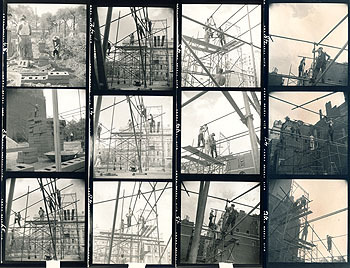 Description: Set of seven contact sheets, 84 images documenting the construction of the Usonian Exhibition House and Pavilion. Photographed by Pedro Guerrero. 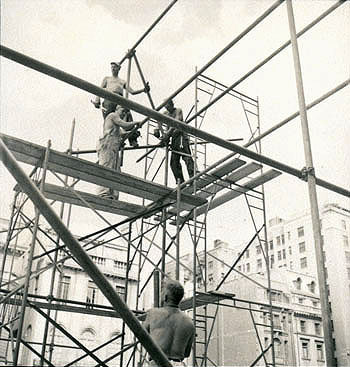 Construction was overseen by David Henken. 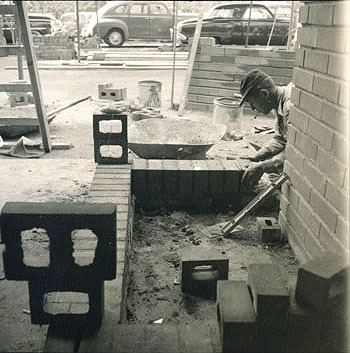 Guerrero wrote: "My greatest involvement with Mr. Wright at this time was during the construction of the Usonian model house and the pavilion for his Sixty Years of Living Architecture Exhibition... 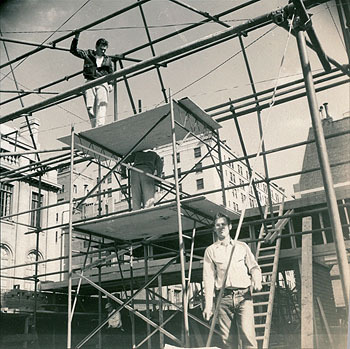 This show, installed on the Guggenheim site... David Hanken, himself a former apprentice, had contracted to build the exhibit structure. We had been good friends since 1948. 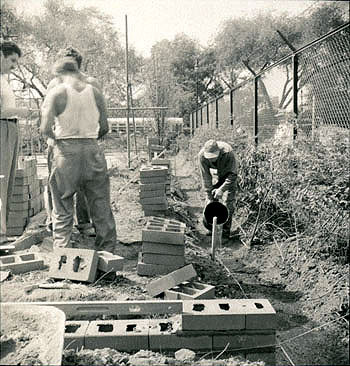 Through him and Mr. Wright, who was on hand nearly every day, I had entree to the site to photograph the project from start to finish..." Picturing Wright, Guerrero, 1994, p.137. 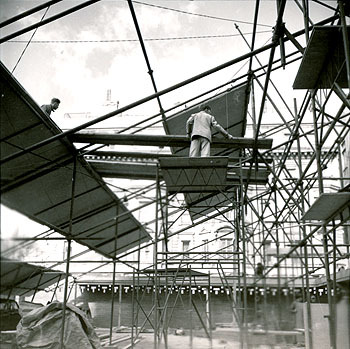 July 24, 1953: "The Guggenheim Foundation decides to host Sixty Years of Living Architecture, the exhibition of Wright�s work that has been touring the world. 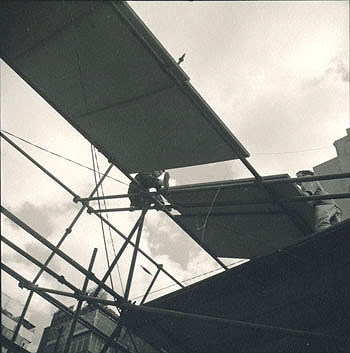 The show will be housed in a temporary pavilion designed by Wright on the site of the future museum. Though the architect is preoccupied with his appearance before the board of standards and appeals in just a few days, Harry Guggenheim is anxious for Sixty Years to be mounted." The Guggenheim, 2009, p.183. Acquired from the estate of David Henken. 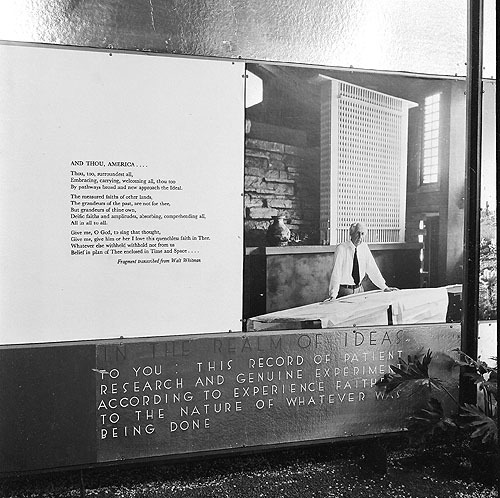 New York Usonian Exhibition House and Pavilion opening reception photographs, October 22,1953. Photographed by Pedro Guerrero. Built on the site for the Guggenheim Museum. Contact sheet 8 x 10, twelve images each 2.25 x 2.25. See twelve images. 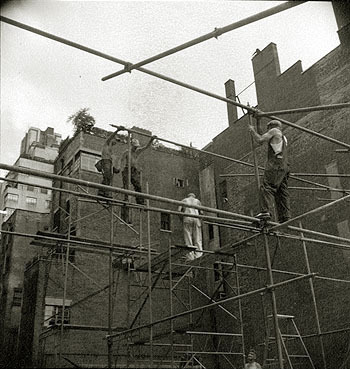 Sixty Years of Living Architecture (New York). 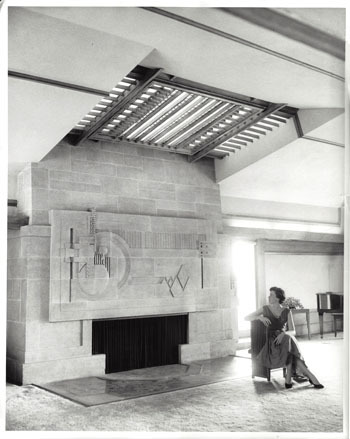 Title: Aline Barnsdall Hollyhock House Living Room Fireplace (1917 - S.208) 1954. 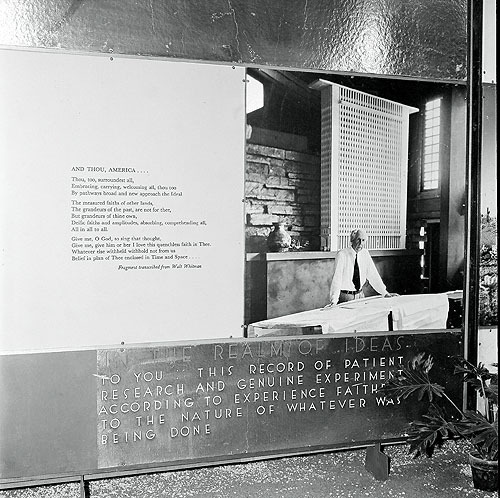 Title: 1) Wright at the Sixty Years of Living Architecture Exhibition, Los Angeles 1954 (Frank Lloyd Wright Foundation project #5427). Description: Wright stands next to Price Tower model. 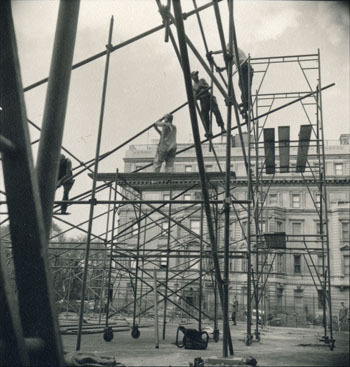 Construction of the Exhibition nears completion. 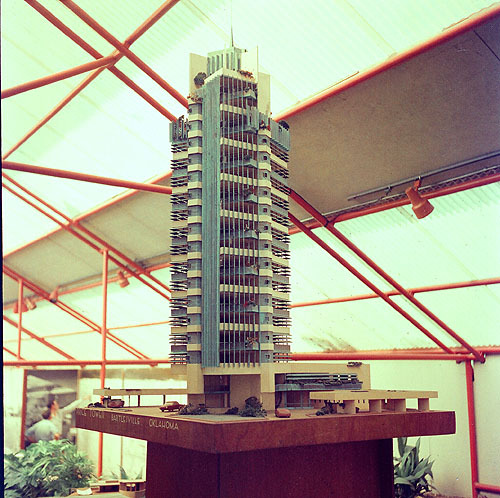 Photographed from the ground looking up at the model of the Price Tower and Frank Lloyd Wright. Wright is wearing a grey suit, tie and pork-pie hat. 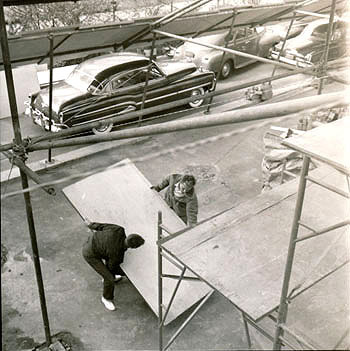 The premiere of the exhibit in Los Angeles was held at the Los Angeles Municipal Art Center at Barnsdall Park on June 1, 1954. A temporary pavilion, similar to the pavilion in New York, was attached to the line of kennels that reached from the house to the garage. The entrance to the pavilion was through the Hollyhock House. (Wright, 1943-1959, p.346). 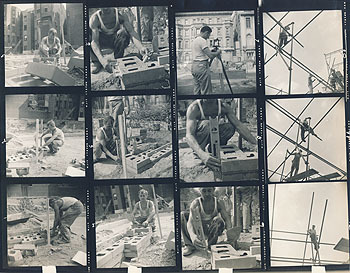 Important set of five photographs, photographed by Gene Barnes. Courtesy of Gene Barnes and his daughter Christina Barnes. Size: 5 x 7 B&W photograph. 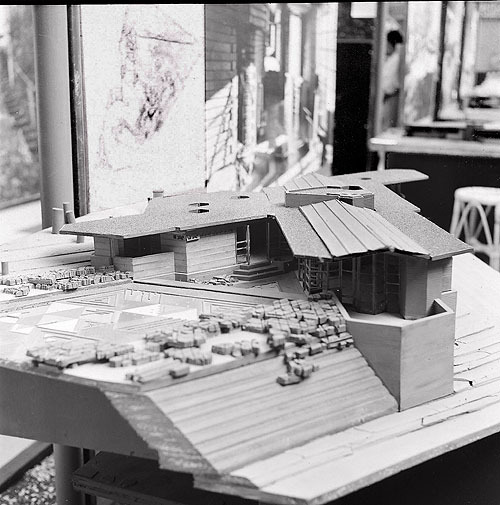 Title: 2) Wright at the Sixty Years of Living Architecture Exhibition, Los Angeles 1954 (Frank Lloyd Wright Foundation project #5427). 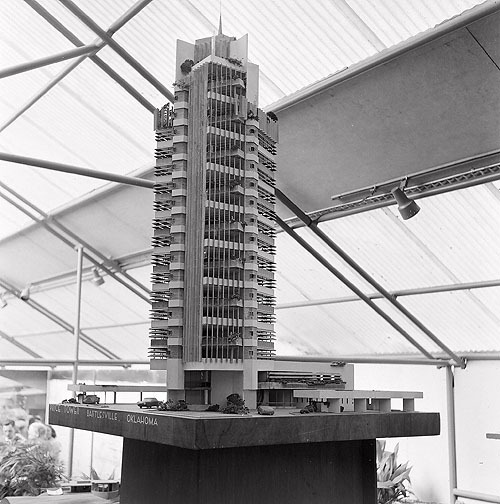 Description: Wright stands next to illustration of Price Tower. 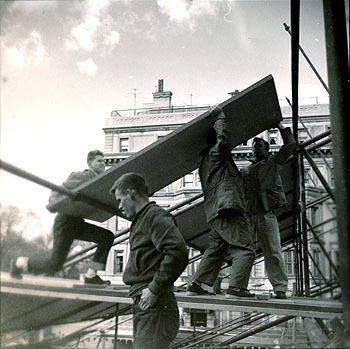 Construction of the Exhibition nears completion. Wright is wearing a grey suit, tie and pork-pie hat. 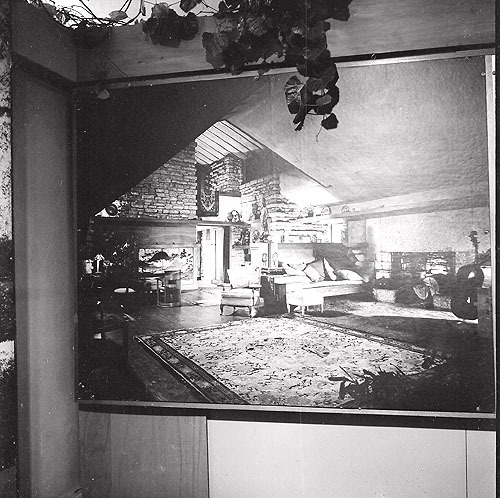 Displayed to his left is an illustration of the Price Tower. 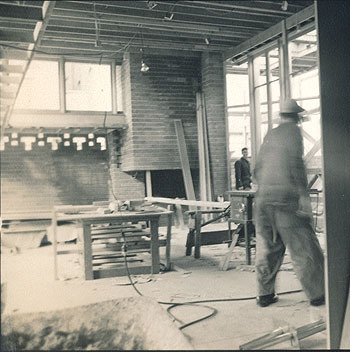 To his right is a photograph of the Robie House. 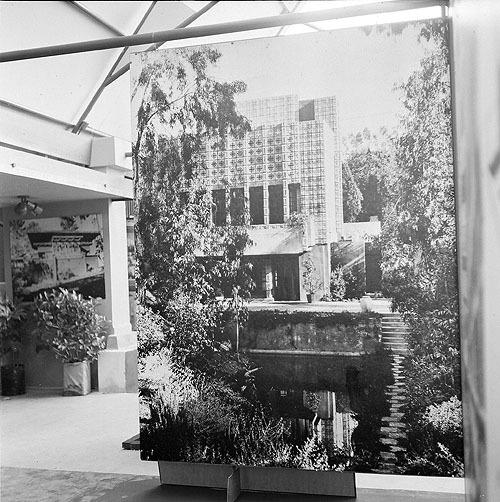 The premiere of the exhibit in Los Angeles was held at the Los Angeles Municipal Art Center at Barnsdall Park on June 1, 1954. A temporary pavilion, similar to the pavilion in New York, was attached to the line of kennels that reached from the house to the garage. The entrance to the pavilion was through the Hollyhock House. 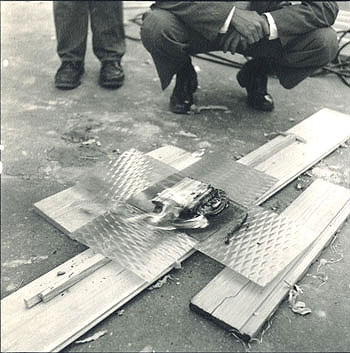 (Wright, 1943-1959, p.346). 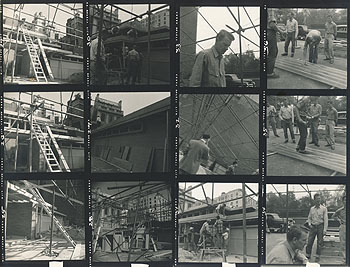 Important set of five photographs, photographed by Gene Barnes. Courtesy of Gene Barnes and his daughter Christina Barnes. Size: 7 x 5 B&W photograph. 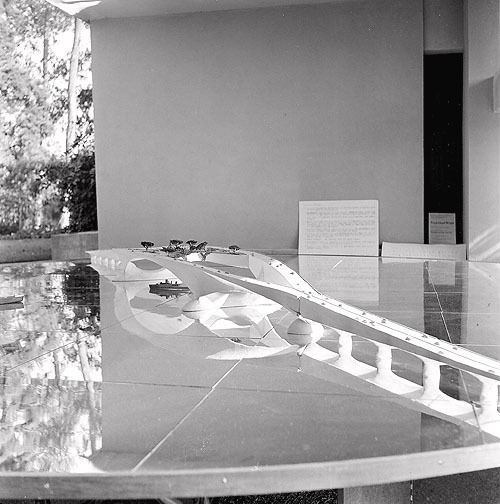 Title: 3) Wright at the Sixty Years of Living Architecture Exhibition, Los Angeles 1954 (Frank Lloyd Wright Foundation project #5427). Description: Wright adds the finishing touches to the Ralph Jester illustration. 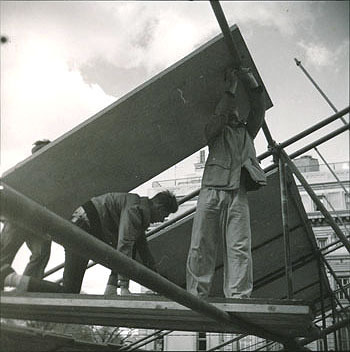 Construction of the Exhibition nears completion. Wright is wearing a grey suit, tie and pork-pie hat. Behind Wright to the left is a photograph of the Imperial Hotel. 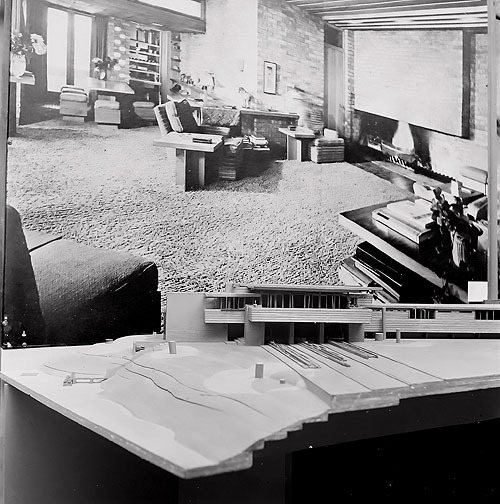 To his right is the model of the Ralph Jester Residence. The premiere of the exhibit in Los Angeles was held at the Los Angeles Municipal Art Center at Barnsdall Park on June 1, 1954. 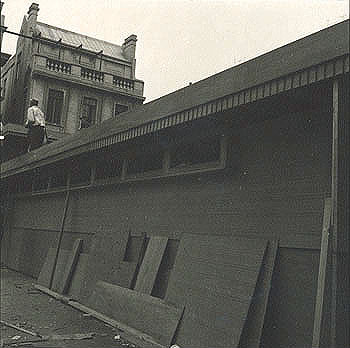 A temporary pavilion, similar to the pavilion in New York, was attached to the line of kennels that reached from the house to the garage. The entrance to the pavilion was through the Hollyhock House. 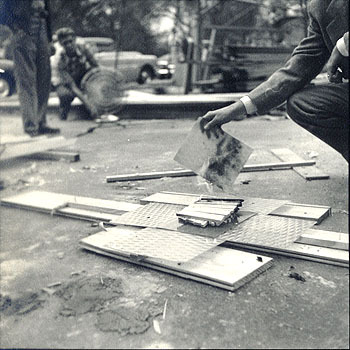 (Wright, 1943-1959, p.346). 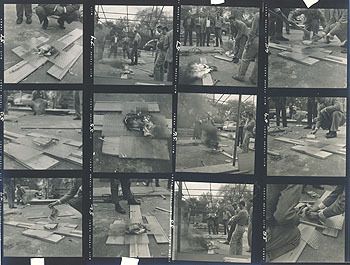 Important set of five photographs, photographed by Gene Barnes. Courtesy of Gene Barnes and his daughter Christina Barnes. 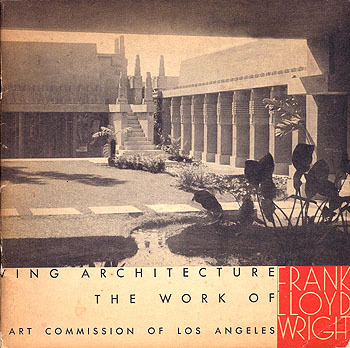 Title: 4) Wright at the Sixty Years of Living Architecture Exhibition, Los Angeles 1954 (Frank Lloyd Wright Foundation project #5427). 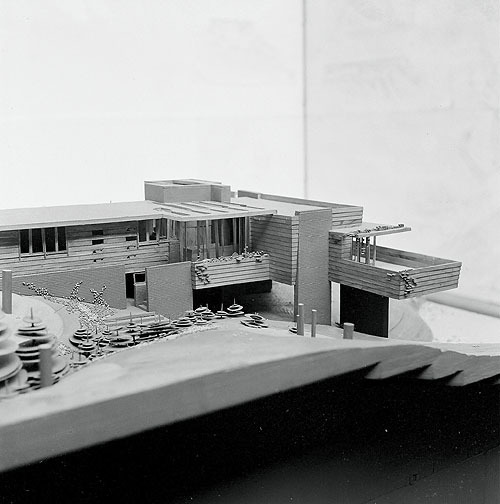 Description: Wright studies the Ralph Jester Residence Model. 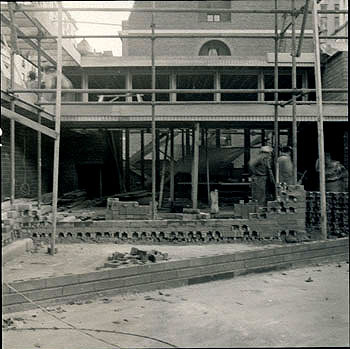 Construction of the Exhibition nears completion. Wright is wearing a grey suit, tie and pork-pie hat. 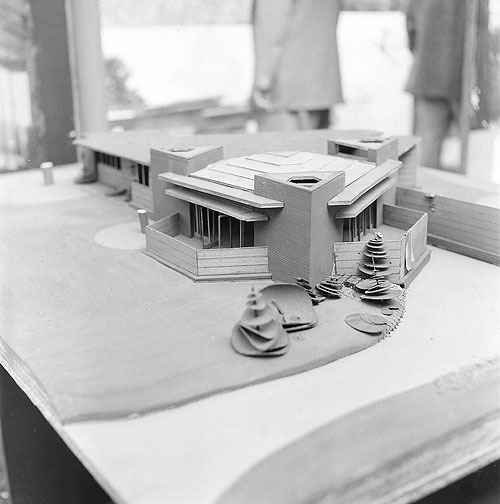 Wright is looking down at the model of the Ralph Jester Residence. Behind him to the left is an illustration of the Gordon Strong Automobile Objective and Planetarium. 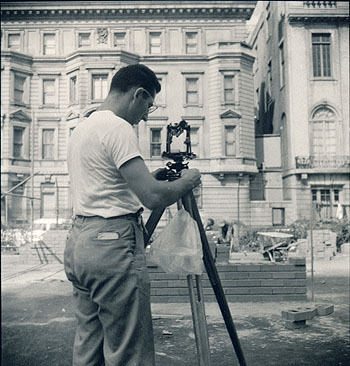 To his right is the Elizabeth Noble Apartment House, Los Angeles, CA. The premiere of the exhibit in Los Angeles was held at the Los Angeles Municipal Art Center at Barnsdall Park on June 1, 1954. A temporary pavilion, similar to the pavilion in New York, was attached to the line of kennels that reached from the house to the garage. The entrance to the pavilion was through the Hollyhock House. (Wright, 1943-1959, p.346). 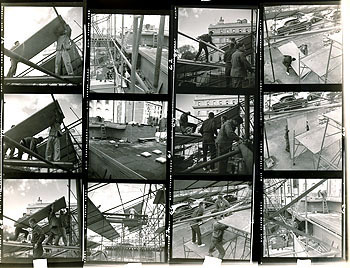 Important set of five photographs, photographed by Gene Barnes. Courtesy of Gene Barnes and his daughter Christina Barnes. Size: 6 x 5 B&W photograph. Title: 5) Wright at the Sixty Years of Living Architecture Exhibition, Los Angeles 1954 (Frank Lloyd Wright Foundation project #5427). Description: Wright jesters with a pencil with his left hand. 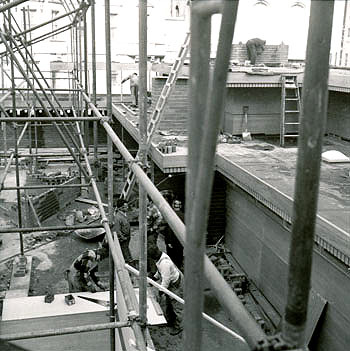 Construction of the Exhibition nears completion. Wright is wearing a grey suit, tie and pork-pie hat. 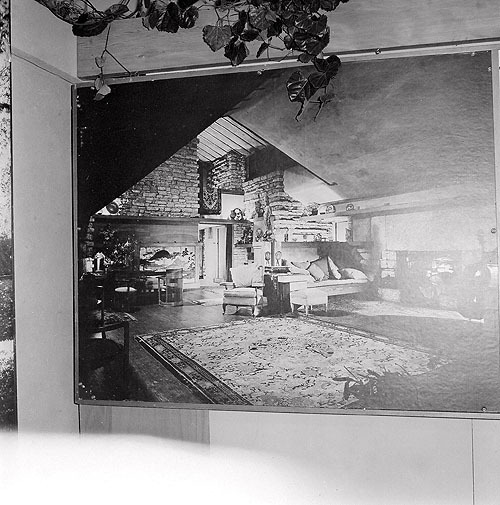 Behind him is a photograph of the Avery Coonley Playhouse. The premiere of the exhibit in Los Angeles was held at the Los Angeles Municipal Art Center at Barnsdall Park on June 1, 1954. A temporary pavilion, similar to the pavilion in New York, was attached to the line of kennels that reached from the house to the garage. The entrance to the pavilion was through the Hollyhock House. (Wright, 1943-1959, p.346). 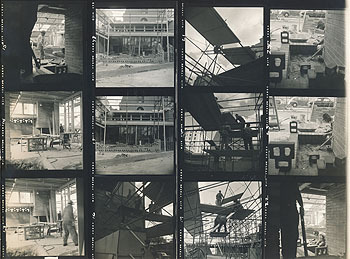 Important set of five photographs, photographed by Gene Barnes. Courtesy of Gene Barnes and his daughter Christina Barnes. 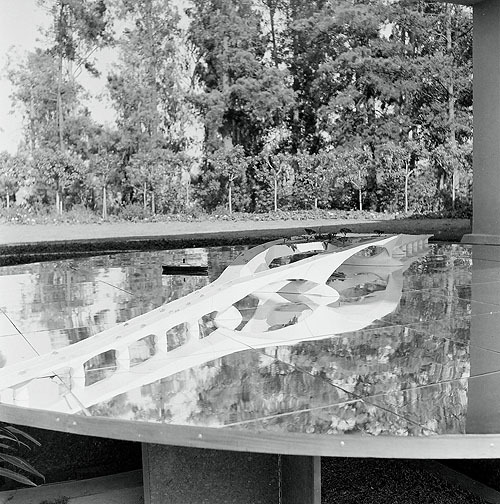 Title: Wright at the Sixty Years of Living Architecture Exhibition, Los Angeles 1954 (Frank Lloyd Wright Foundation project #5427). 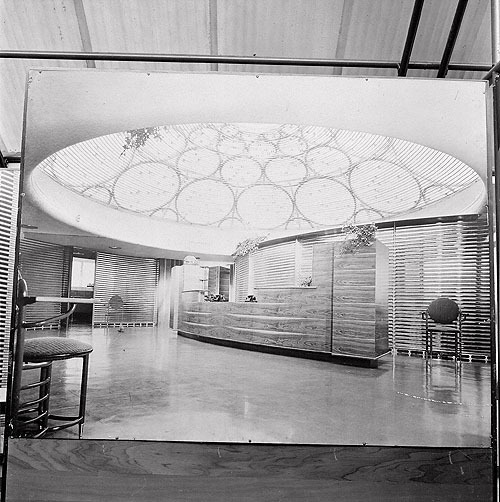 Description: View of the pavilion during the Grand opening June 1, 1954. In the foreground on the left is a model of the Ralph Jester Residence. 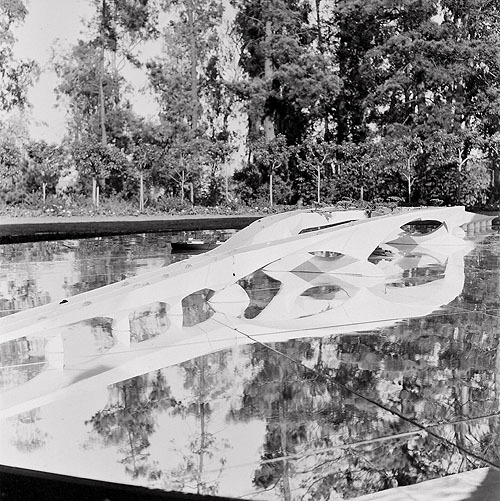 The premiere of the exhibit in Los Angeles was held at the Los Angeles Municipal Art Center at Barnsdall Park. 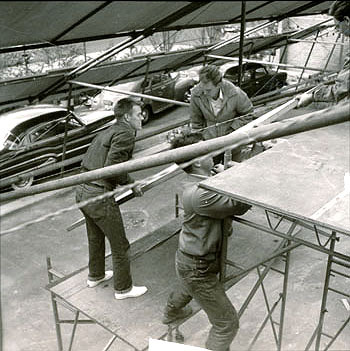 A temporary pavilion, similar to the pavilion in New York, was attached to the line of kennels that reached from the house to the garage. The entrance to the pavilion was through the Hollyhock House. (Wright, 1943-1959, p.346). Photographed by Los Angeles photographer Paegel. Courtesy of the University of Southern California Libraries. 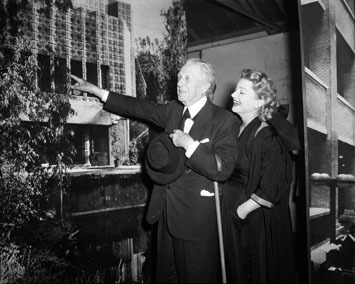 Title: Wright and Anne Baxter at the Sixty Years of Living Architecture Exhibition, Los Angeles 1954 (Frank Lloyd Wright Foundation project #5427). 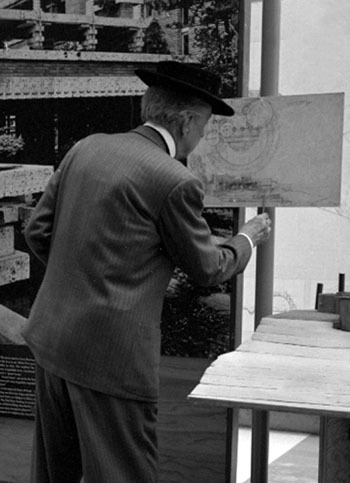 Description: Frank Lloyd Wright points to a photograph of La Miniatura (1923 - S.214). He and Baxter are facing to the left of the camera. Wright has a cane over his right arm and he is holding his hat. Baxter, Wright�s granddaughter is standing to the right. 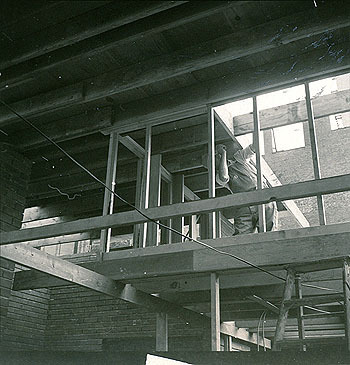 To their right is a photograph of the interior of the Larkin Building (1903 - S.093). 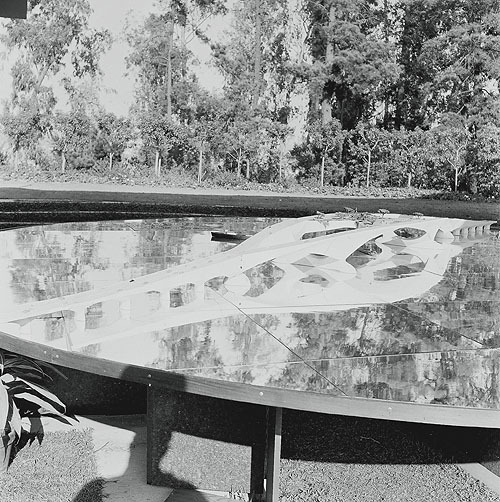 The premiere of the exhibit in Los Angeles was held at the Los Angeles Municipal Art Center at Barnsdall Park. 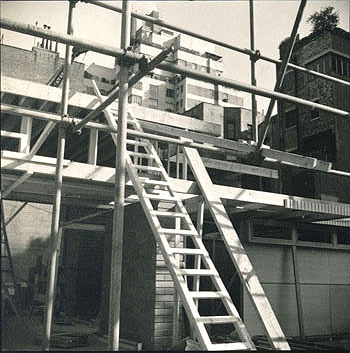 A temporary pavilion, similar to the pavilion in New York, was attached to the line of kennels that reached from the house to the garage. The entrance to the pavilion was through the Hollyhock House. (Wright, 1943-1959, p.346). Photographed by Los Angeles photographer Paegel. Courtesy of the University of Southern California Libraries. Size: Set of 41 B&W and color 2.25" negatives, high res scans, and 8 x 8 B&W and Color photographs. 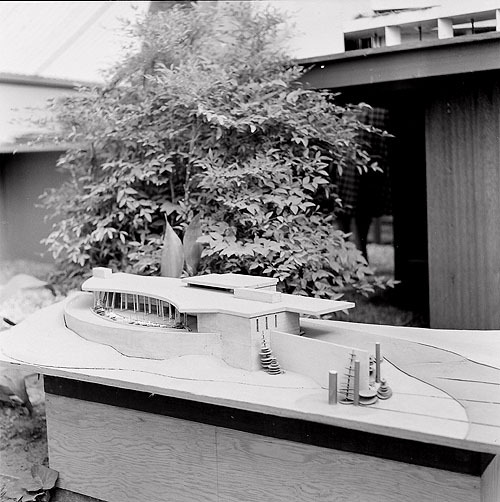 Sixty Years of Living Architecture Exhibition, Los Angeles 1954 (Frank Lloyd Wright Foundation project #5427). Set of 41 B&W and color photographs by Loch Crane, Wright apprentice from 1941-42. Note: this is one of the most extensive set of images of the Los Angeles exhibition we have seen to date. 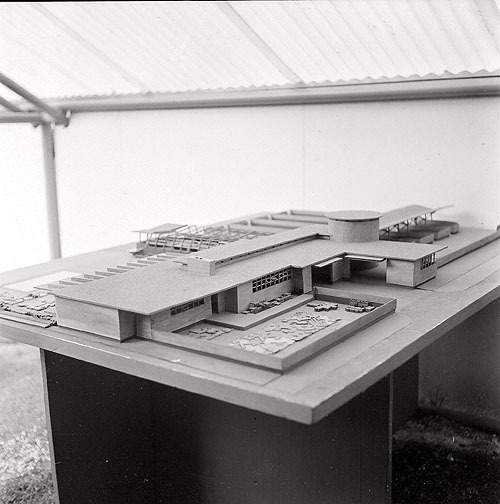 "Sixty Years of Living Architecture: The Work of Frank Lloyd Wright" was a traveling exhibition of Wright's work, consisting of models, photographs and original drawings. 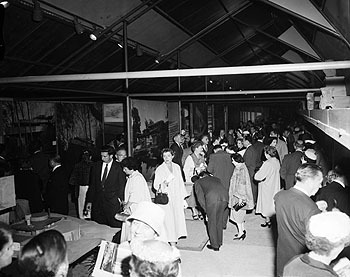 A Preview of the exhibition was held in Philadelphia (January 1951). The world wide tour opened in Palazzo Strozzi Florence, Italy (June 1951). 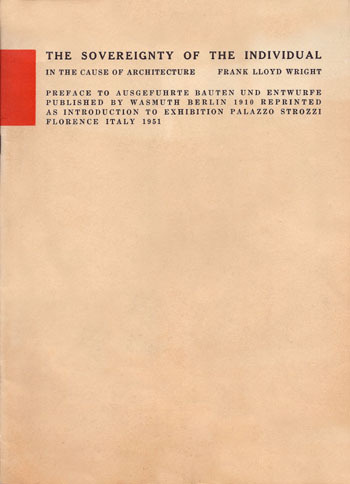 In "Sixty Years" (New York), Wright notes that from Florence the Exhibition traveled to "Switzerland, France, German and Holland". The Exhibition catalogs are dated: Paris (April 1952), Zurich (End of May 1952), Munich (May 16 - June 15, 1952), and Rotterdam (dated June 1, 1952). 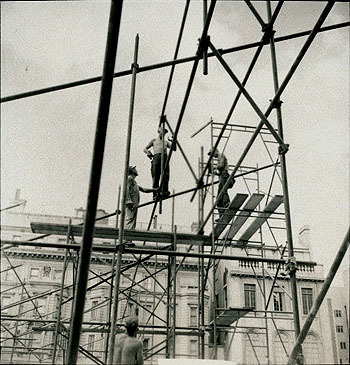 After two years in Europe the exhibition crossed the Atlantic to Mexico City, then to New York (1953). 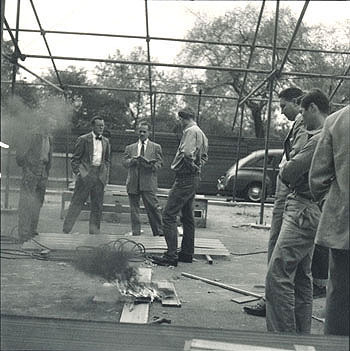 After an exhibition in Los Angeles, June, 1954, the final exhibition took place in Chicago, October, 1956. 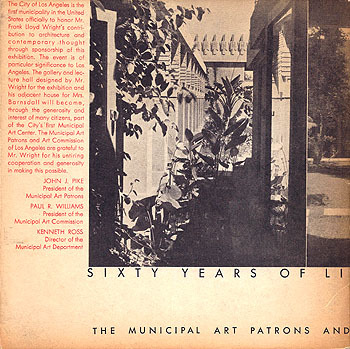 The Los Angeles exhibition premiere was held at Barnsdall Park�s Municipal Art Center on June 1, 1954, then open to the public from June 2 to July 11, and was extended to July 25, 1954. 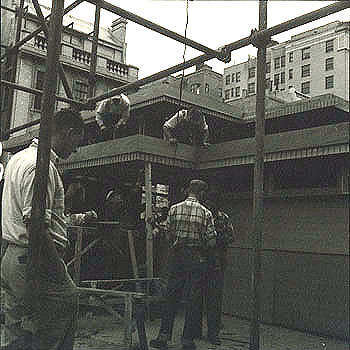 A temporary pavilion, similar to the pavilion in New York, was attached to the line of kennels that reached from the house to the garage. The entrance to the pavilion was through the Hollyhock House. (Wright, 1943-1959, p.346). 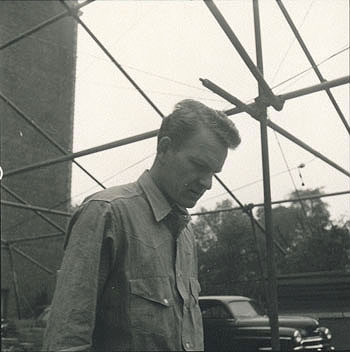 Loch Crane arrived in Arizona in March 1941, and Wright accepted him into the fellowship. After Pearl Harbor, he joined the Army and terminated his Taliesin fellowship in April 1942. 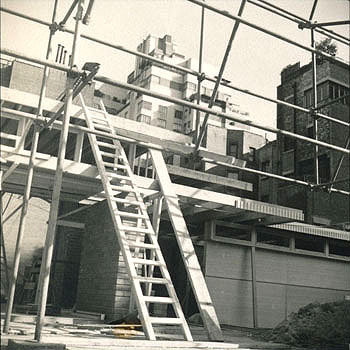 After World War II, he stayed in Japan through 1946, spending his free time photographing, drawing and researching Japanese architecture. 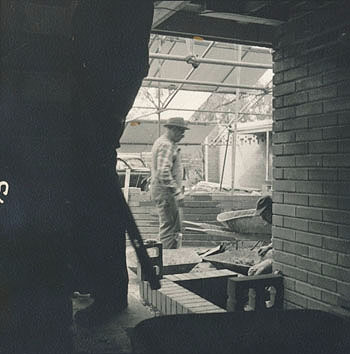 He returned to San Diego in late 1946 and established his first drafting office while preparing for architectural examinations. 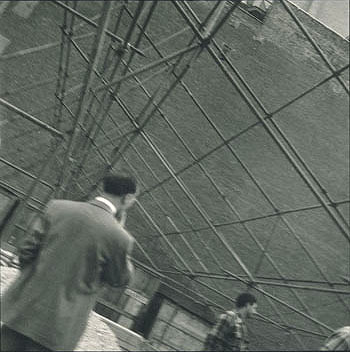 Photographed by Loch Crane during a visit to the exhibition in June, 1954. Frank Lloyd Wright Day and The Mile High Building "The Illinois"
"Sixty Years of Living Architecture" was exhibited in Chicago from October 16, 17 and 18, 1956 at the Hotel Sherman, Chicago. Frank Lloyd Wright�s Mile-High Building was shown for the first time Tuesday, October 16, with a 22-foot visualization of mile-high building which Wright proposed for Chicago. Mayor Daley proclaimed October 17, Frank Lloyd Wright Day. October 6 (Saturday): Wright meets with Mayor Richard Daley at the Mayor�s office in Chicago. Most likely the official presentation of the certificate proclaiming October 17, Frank Lloyd Wright Day. 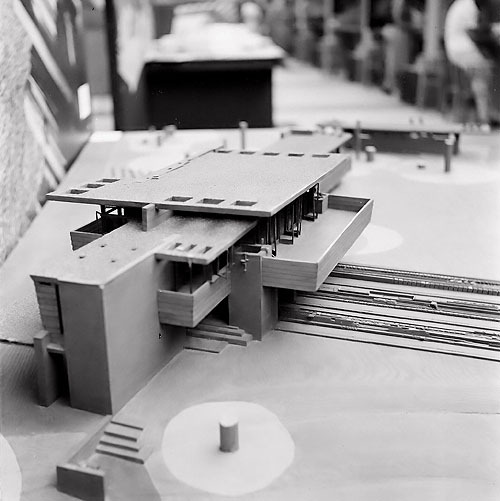 October 16 (Tuesday): Wright holds a Press conference at the Hotel Sherman to open the exhibition and unveil the Mile High Building "The Illinois" with a 22-foot visualization, proposed by architect Frank Lloyd Wright for Chicago. 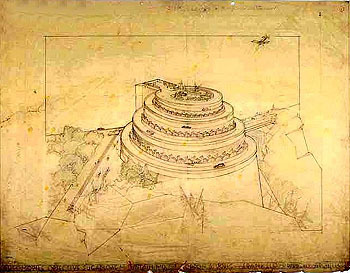 The giant visualization was prepared by Wright and his apprentice architects at Taliesin. 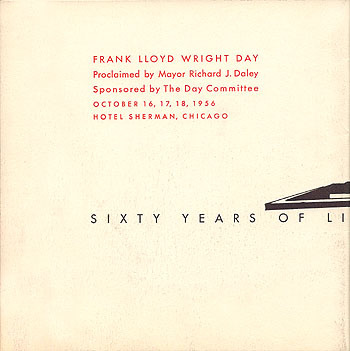 October 17 (Wednesday): Mayor Daley proclaimed October 17, Frank Lloyd Wright Day. Details of the mammoth structure were explained by Wright at a dinner in his honor Wednesday evening at the Hotel Sherman. The dinner was sponsored by the Frank Lloyd Wright Endowment Fund for the perpetuation of Taliesin. Wright was the guest of honor. Other guests of honor included Mrs. Frank Lloyd Wright and Mayor Richard Daley who presented a plaque declaring "this day to be Frank Lloyd Wright Day". Other honored guests included Ludd M. Spivey, President of Florida Southern College who sat to Wright's left at the speaker's table, and Ivan Nestigan, Mayor of Madison Wisconsin. Wright�s sister Mrs. Maginel Wright Barney was also in attendance. The proposed Mile-High would be 528 stories tall, could hold 100,000 people and would cost about $100 million. 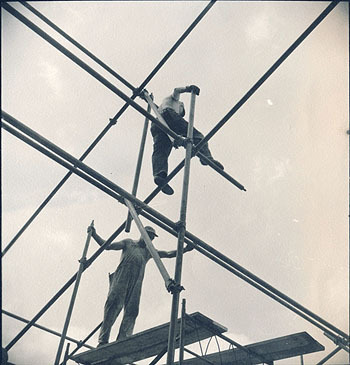 The "eighth wonder of the world" was to be erected of steel and glass, with floors extending outward from a central core like branches from a tree trunk. 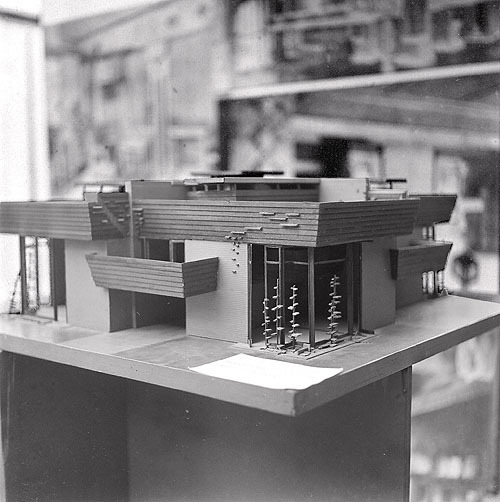 Wright�s design drew jeers and cheers. The architect insisted the structure was "practical and expedient." 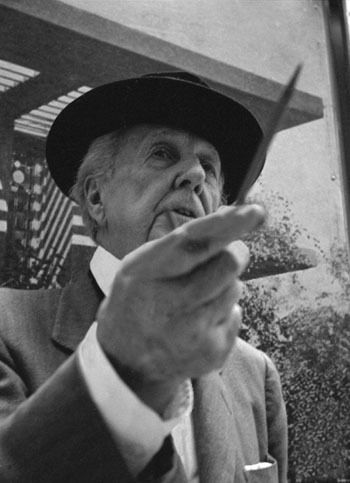 October 19 (Friday): Frank Lloyd Wright Spoke at Orchestra Hall, Friday Evening, October 19, at 8:15pm. 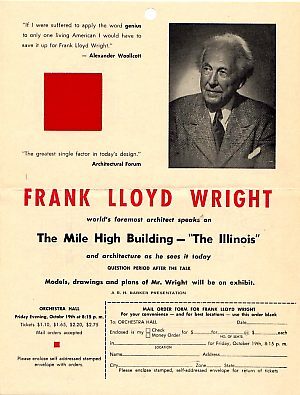 Title: Flyer announcing Frank Lloyd Wright speaks on The Mile-High Building - "The Illinois"
Description: (Related to above booklet) Frank Lloyd Wright Speaks at the Orchestra Hall, Friday Evening, October 19th at 8:15pm. Similar photograph (coat and tie) "Wright and grandson, Brandoch Peters" Circa 1950. 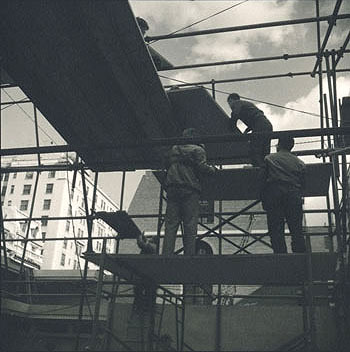 Title: Wright working on a large drawing of the Mile High Building "The Illinois", 1956. 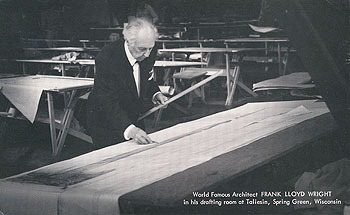 Description: Frank Lloyd Wright in his drafting room at Taliesin Spring Green, finishing the drawing of the Mile high Building. 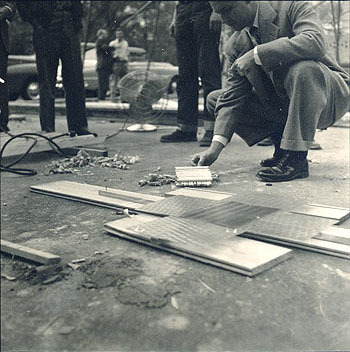 Three drawings were prepared for the news conference held on October 16, 1956, in conjunction with "Sixty Years of Living Architecture," exhibited in Chicago from October 16, 17 and 18, 1956 at the Hotel Sherman. On October 16, Wright held a Press conference at the Hotel Sherman to open the exhibition and unveil the Mile High Building "The Illinois" for the first time. Wright proposed the building for Chicago. Photograph by Edgar Obma. 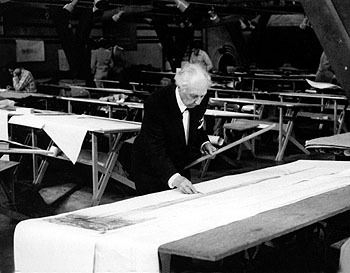 Title: Frank Lloyd Wright working on a large drawing of the Mile High Building "The Illinois", 1956. Description: Text on face: "World Famous Architect Frank Lloyd Wright in his drafting room at Taliesin, Spring Green, Wisconsin." 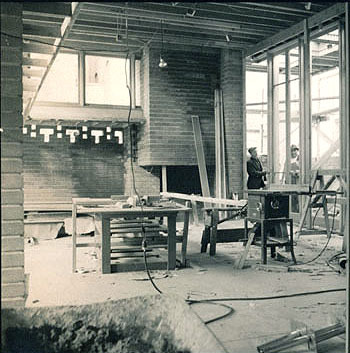 Frank Lloyd Wright in his drafting room at Taliesin Spring Green, finishing the drawing of the Mile high Building. 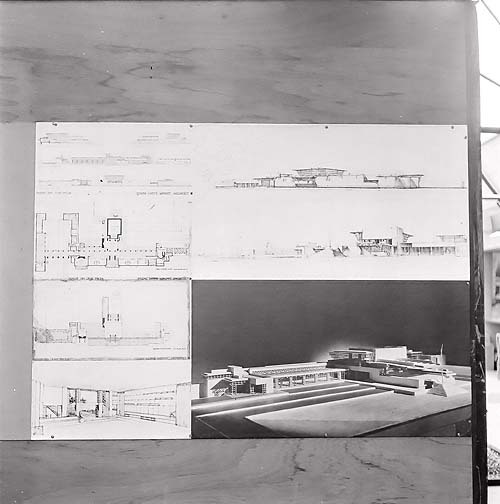 Three drawings were prepared for the news conference held on October 16, 1956, in conjunction with "Sixty Years of Living Architecture," exhibited in Chicago from October 16, 17 and 18, 1956 at the Hotel Sherman. On October 16, Wright held a Press conference at the Hotel Sherman to open the exhibition and unveil the Mile High Building "The Illinois" for the first time. 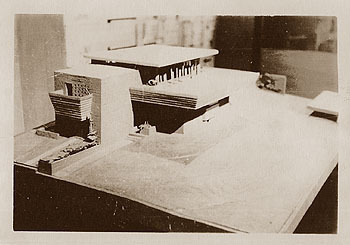 Wright proposed the building for Chicago. Text on verso: "Edgar L. Obma A. P. S. A., Dodgeville, Wisconsin." 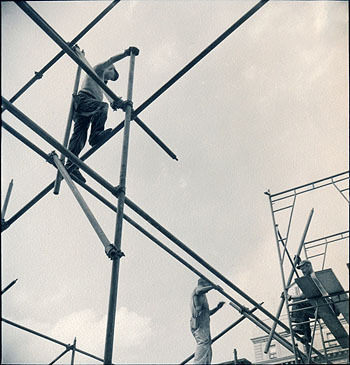 Photograph by Edgar Obma. Title: Taliesin, Spring Green 1956 (Taliesin III 1925 - S.218). 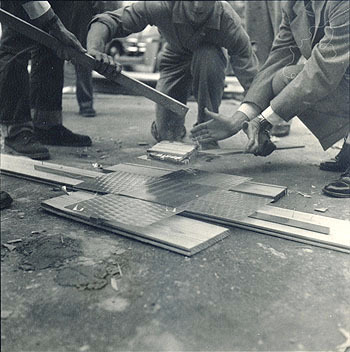 Description: Frank Lloyd Wright works on his Mile-High Building illustration in preparation for the news conference held on October 16, 1956, in conjunction with "Sixty Years of Living Architecture," exhibited in Chicago from October 16, 17 and 18, 1956 at the Hotel Sherman. On October 16, Wright held a Press conference at the Hotel Sherman to open the exhibition and unveil the Mile High Building "The Illinois" for the first time. 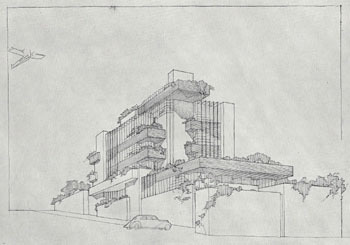 Wright proposed the building for Chicago. 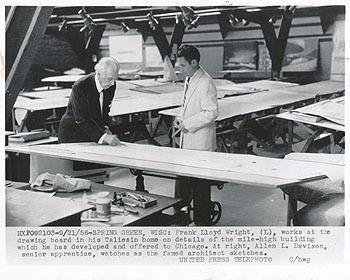 Text on face: "9/21/56 - Spring Green, Wisc: Frank Lloyd Wright, (L), works at the drawing board in his Taliesin home on details of the mile-high building which he has developed and offered to Chicago. 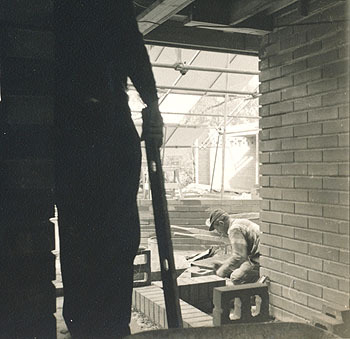 At right, Allen L. Davidson, senior apprentice, watches as the famous architect sketches. United Press Telephoto." Stamped on verso: "1956 Sept 21." 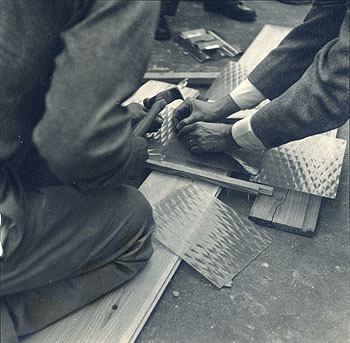 Clipping pasted to verso: "Frank Lloyd Wright, left, worked at the drawing board in his Taliesin home at Spring Green, Wis., on details of the mile-high building which he has developed and offered to Chicago. 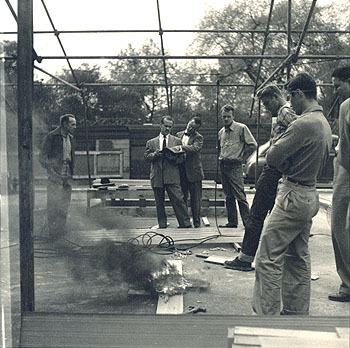 Allen L. Davidson, senior apprentice, watched the famous architect sketch plans." Title: Mile High Building "The Illinois", 1956. 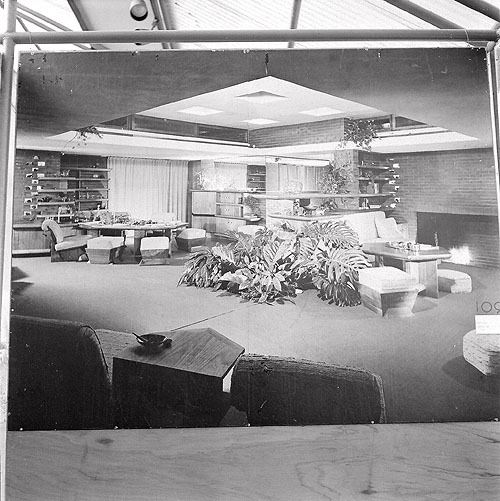 Description: (Note: It is labeled "Mile High Building", but is not the building Frank Lloyd Wright designed.) Pasted on verso: "Mile-High Building. 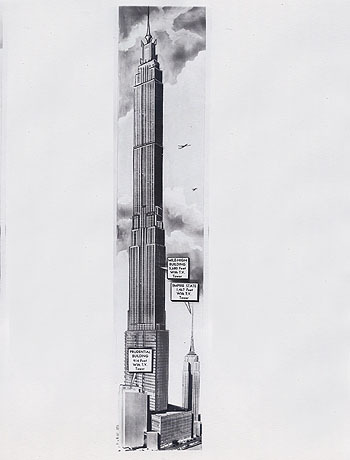 Chicago: A mile-high building proposed by architect Frank Lloyd Wright is pictured in this artist�s sketch alongside two present day versions of �Skyscrapers.� Drawn by George Charney, of the Chicago Daily News, the sketch compares Wright�s proposed building with the Prudential Building in Chicago and the Empire State Building in New York. Wright, who suggests his building should be placed alongside Lake Michigan in Chicago, says the structure could hold 100,000 people. 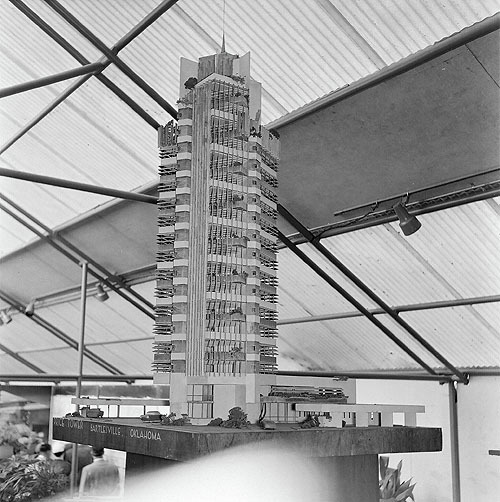 Typical of the comments which greeted Wright�s proposal was one from an architect; He suggested the 510-story project be built on its side. (United Press Photo) 9/5/56." 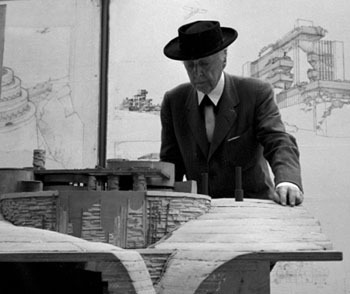 Frank Lloyd Wright Day, October 17, 1956. 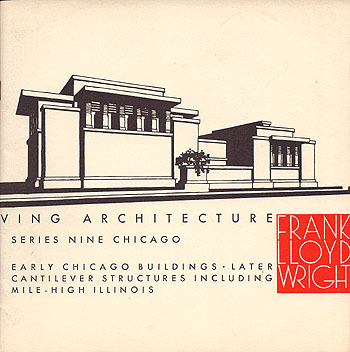 Mayor Richard Daley, Chicago, proclaimed October 17, Frank Lloyd Wright Day. Description: Wright meets with Mayor Richard Daley at the Mayor�s office in Chicago on October 6 1956. Most likely the official presentation of the certificate proclaiming October 17, Frank Lloyd Wright Day. 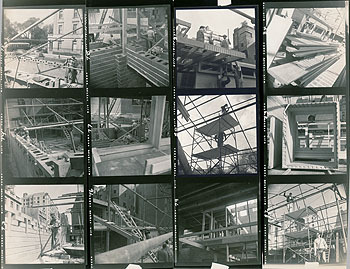 "Sixty Years of Living Architecture" was exhibited in Chicago from October 16, 17 and 18, 1956 at the Hotel Sherman, Chicago. Mayor Daley proclaimed October 17, Frank Lloyd Wright Day. Details of the mammoth structure were explained by Wright at a dinner in his honor Wednesday evening at the Hotel Sherman. Major Daley presented Wright with a plaque proclaiming the official proclamation. The dinner was sponsored by the Frank Lloyd Wright Endowment Fund for the perpetuation of Taliesin. Wright was the guest of honor. Label pasted on verso: "Chicago Sun-Times. Date: 10/6/56. Photographer: Joe Kordick. 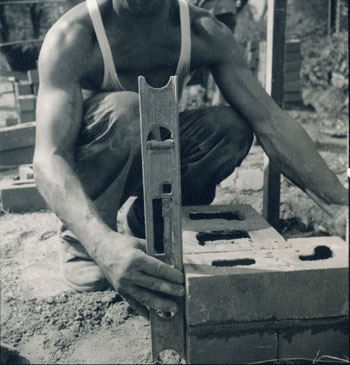 Subject: Frank Lloyd Wright. Location: Mayors Office. 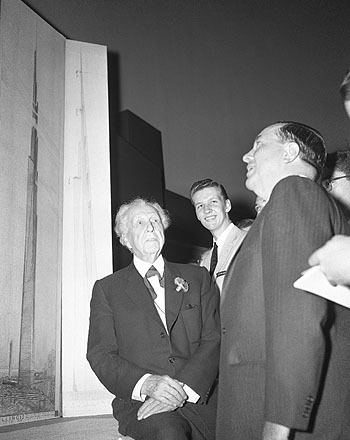 Caption: Frank Lloyd Wright visits Mayor Richard J. Dailey." Size: 5.5 x 6.8 B&W photograph. 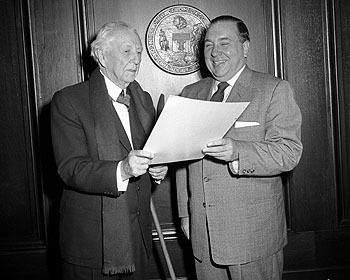 Description: Wright meets with Mayor Richard Daley at the Mayor�s office in Chicago on October 6 1956. Most likely the official presentation of the certificate proclaiming October 17, Frank Lloyd Wright Day. 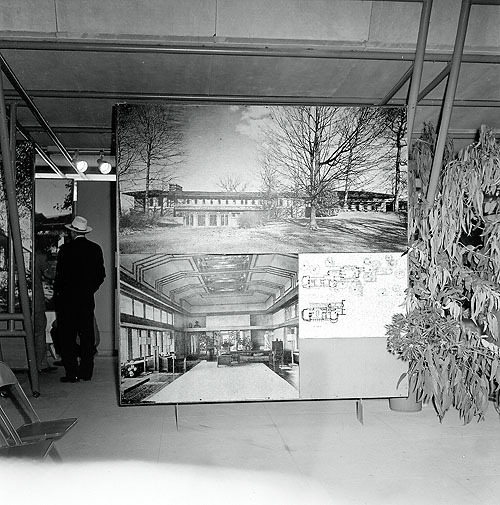 "Sixty Years of Living Architecture" was exhibited in Chicago from October 16, 17 and 18, 1956 at the Hotel Sherman, Chicago. Mayor Daley proclaimed October 17, Frank Lloyd Wright Day. Details of the mammoth structure were explained by Wright at a dinner in his honor Wednesday evening at the Hotel Sherman. 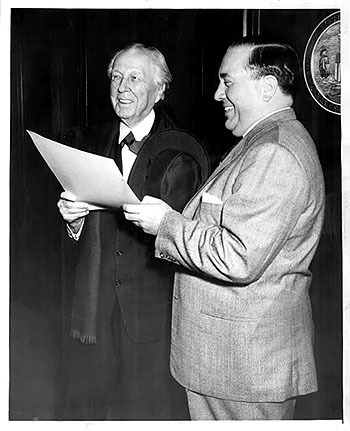 Major Daley presented Wright with a plaque proclaiming the official proclamation. The dinner was sponsored by the Frank Lloyd Wright Endowment Fund for the perpetuation of Taliesin. Wright was the guest of honor. 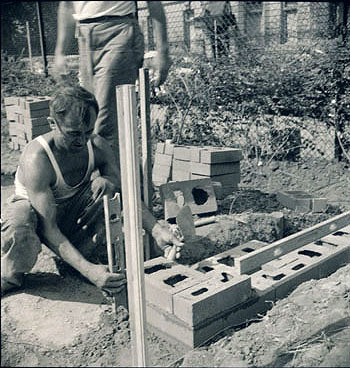 Text typed on negative sleeve: "Wright � Frank Lloyd, architect cdn 10-6-56, with Mayor Dailey." Acquired from the archives for the Chicago Daily News. 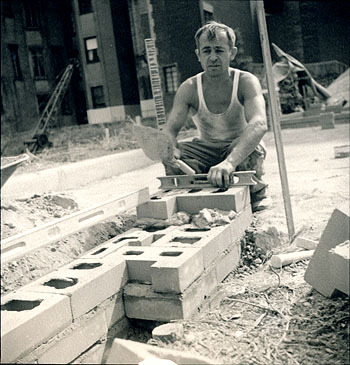 Size: Original 4x5 B^&W negative, 10 x 8 B&W photograph, 43 x 35" High Res digital image. 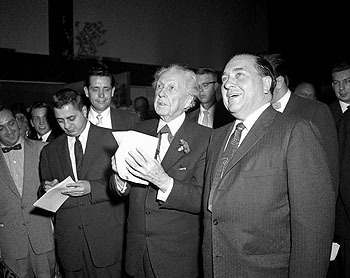 Description: Frank Lloyd Wright Press Conference, October 16, 1956. 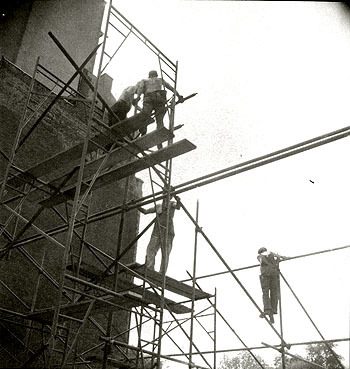 "Sixty Years of Living Architecture" was exhibited in Chicago from October 16, 17 and 18, 1956 at the Hotel Sherman, Chicago. 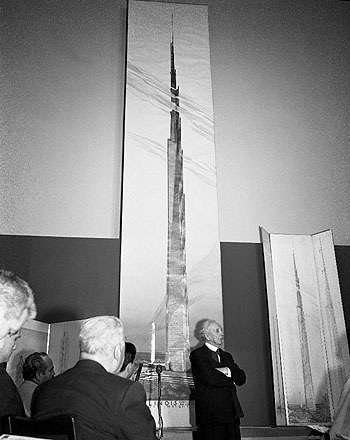 On October 16, Wright held a Press conference at the Hotel Sherman to open the exhibition and unveil the Mile High Building "The Illinois" for the first time with a 22-foot visualization, proposed by architect Frank Lloyd Wright for Chicago. 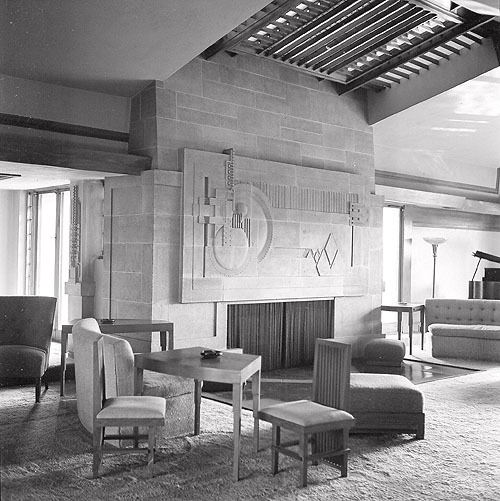 The giant visualization was prepared by Wright and his apprentice architects at Taliesin. Mayor Daley proclaimed October 17, Frank Lloyd Wright Day. 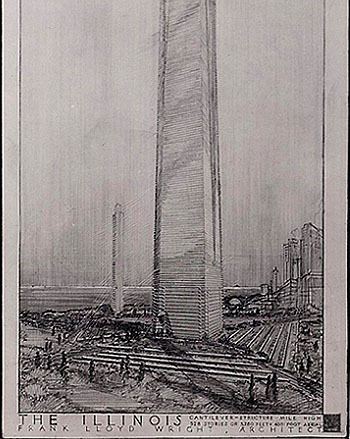 Caption reads: "The Mile High Illinois, Illinois Sky-City, or simply the Illinois was a proposed mile-high (1,609 meters/5,280 feet) skyscraper, envisioned by Frank Lloyd Wright in 1956. the design, intended to be built in Chicago, would have included 528 stories, with a gross area of 18.46 million square feet (1.71 million square meters/171 hectares). If built, it would be the tallest building in the world." Acquired from the archives of the Chicago Sun Times. Size: 8 x 10 B&W print, original 4 x 5 B&W negative. 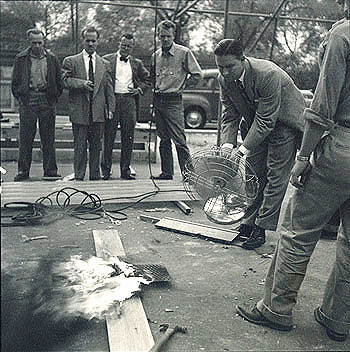 Description: Frank Lloyd Wright Press Conference, October 16, 1956. Twenty-two foot illustration behind him, Price Tower to the left, smaller tri-fold to the right. 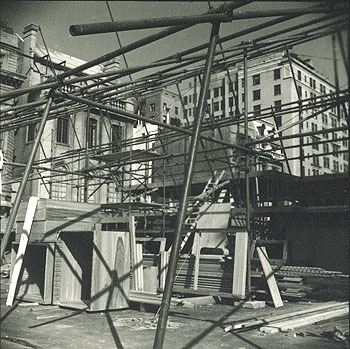 "Sixty Years of Living Architecture" was exhibited in Chicago from October 16, 17 and 18, 1956 at the Hotel Sherman, Chicago. 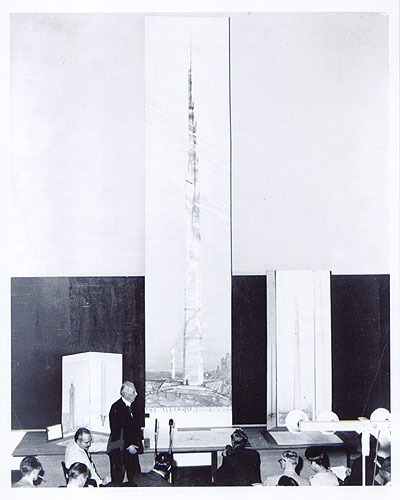 On October 16, Wright held a Press conference at the Hotel Sherman to open the exhibition and unveil the Mile High Building "The Illinois" for the first time with a 22-foot visualization, proposed by architect Frank Lloyd Wright for Chicago. 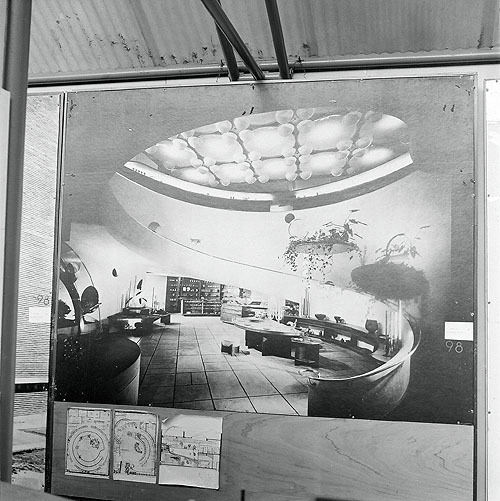 The giant visualization was prepared by Wright and his apprentice architects at Taliesin. Mayor Daley proclaimed October 17, Frank Lloyd Wright Day. 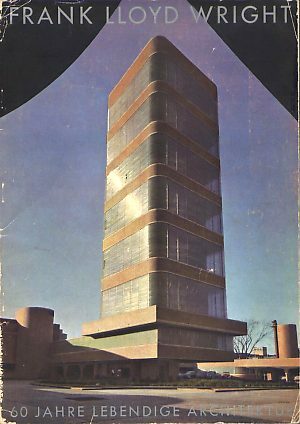 Caption reads: "Frank Lloyd Wright & Mile High Bldg 1956. 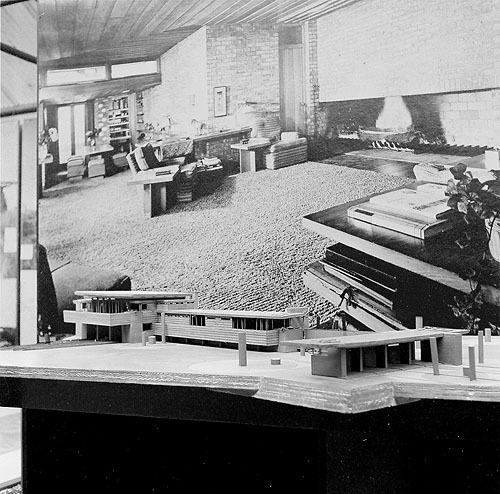 Frank Lloyd Wright stands in front of a model sketch of his Mile High Building at the Sherman Hotel October 16, 1956." 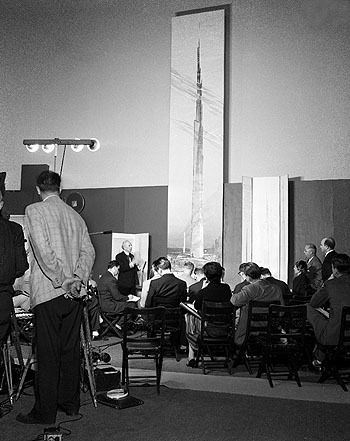 Title: Frank Lloyd Wright Press Conference, October 16, 1956. 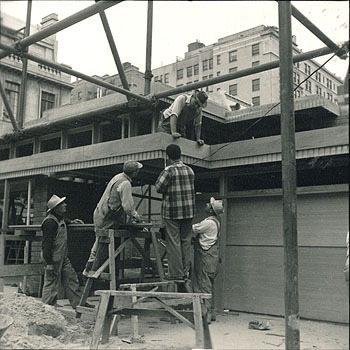 Description: "Sixty Years of Living Architecture" was exhibited in Chicago from October 16, 17 and 18, 1956 at the Hotel Sherman, Chicago. 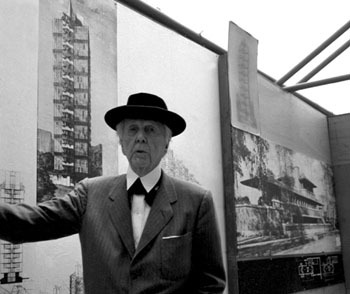 On October 16, Wright held a Press conference at the Hotel Sherman to open the exhibition and unveil the Mile High Building "The Illinois" for the first time with a 22-foot visualization, proposed by architect Frank Lloyd Wright for Chicago. The giant visualization was prepared by Wright and his apprentice architects at Taliesin. Mayor Daley proclaimed October 17, Frank Lloyd Wright Day. 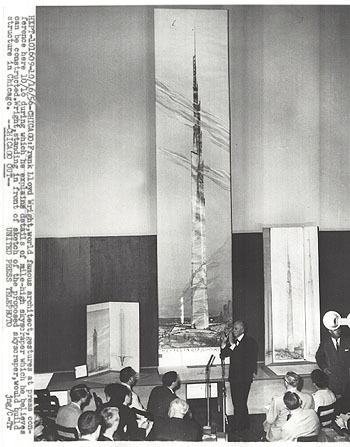 Caption on face: "10/16/56 - Chicago: Frank Lloyd Wright, world famous architect, gestures at press conference here 10/16 during which he explains details of mile-high skyscraper which he believes can be constructed. 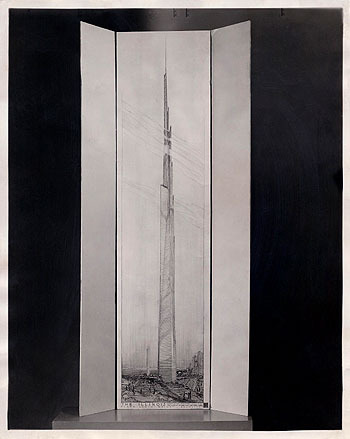 Wright, standing in front of sketch of the proposed skyscraper, would build structure in Chicago." Stamped on verso: "Reference, Oct 22 �56, N. E. A." 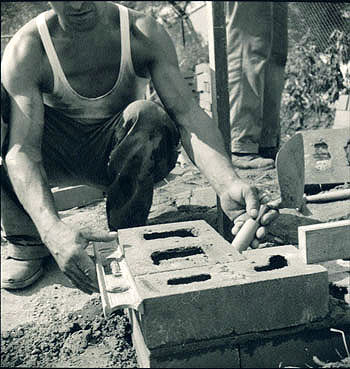 Description: Frank Lloyd Wright Day. Proclaimed by Mayor Richard J. Daley. Sponsored by The Day Committee, October 16, 17, 18, 1956. Hotel Sherman, Chicago. 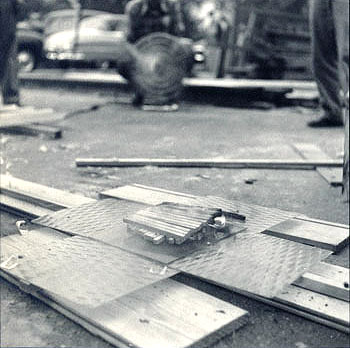 Photographed on October 16, 1956. Limited edition 8.5 x 11 print from digital negatives on satin semi gloss Semisatinado paper. 2/100. 2007. Description: Mile High Building "The Illinois", 1956. Pasted on verso: "From: J. Dennis O�Brien (Chicago Office). 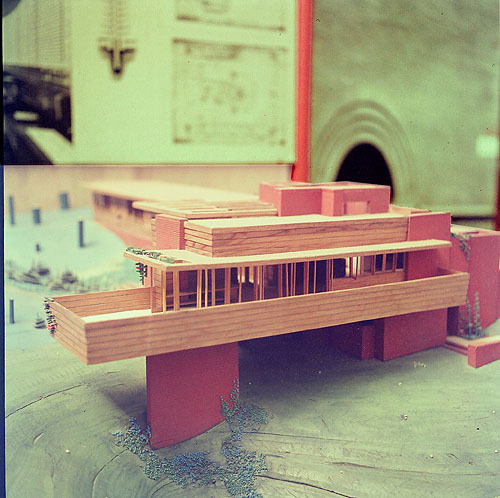 Harshe-Rotman, Inc. For: Frank Lloyd Wright Endowment Fund. 29 S. LaSalle St., Chicago. Oct. 16, 1956. For Immediate Release. 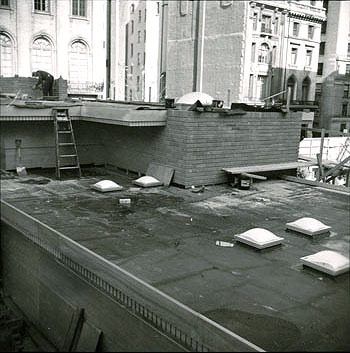 First view of Frank Lloyd Wright�s Mile-High Building. Shown for the first time Tuesday (Oct. 16) was this 22-foot visualization of mile-high building proposed by architect Frank Lloyd Wright for Chicago. Details of the mammoth structure will be explained by Wright at a dinner in his honor to be held Wednesday (Oct. 17) at the Hotel Sherman. 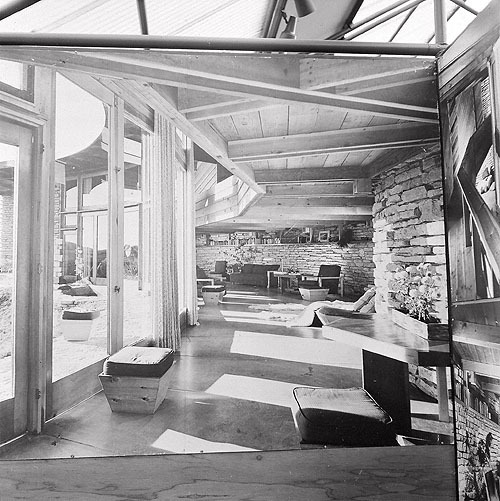 The giant visualization was prepared by Wright and apprentice architects at Taliesin, unique architectural school conducted by Mr. And Mrs. Wright at their Spring Green, Wis. Home. 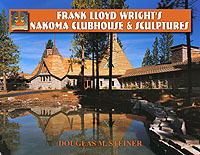 The dinner is being sponsored by the Frank Lloyd Wright Endowment Fund for the perpetuation of Taliesin." Clipping on verso: Stamped "Feb 4, 1959". "That Mile-High Skyscraper? - Famed architect Frank Lloyd Wright proposed in 1956 to build it in Chicago. He said it would be 528 stories tall, could hold 100,000 people, would cost about $100 million. The "eighth wonder of the world" was to be erected of steel and glass, with floors extending outward from a central core like branches from a tree trunk. 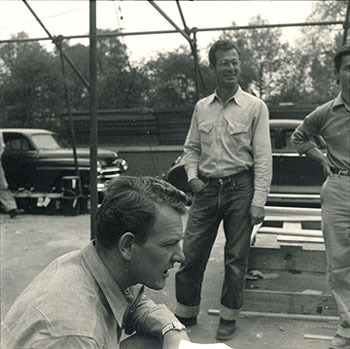 Wright�s design drew jeers and cheers. The architect insisted the structure was "practical and expedient." Today, more than two years after Wright bared his daring idea, the mile-high building is no further along than a drawing. A spokesman for Wright says no group is currently interested in building or backing it." Clipping on verso: Stamped "Apr 9, 1959". 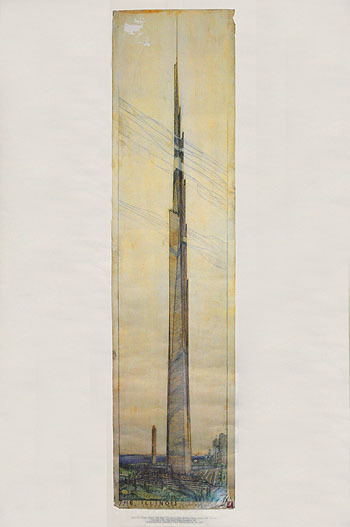 "Here�s sketch of mile-high skyscraper as envisioned for Chicago by Frank Lloyd Wright." Acquired from the archives of the Chicago Sun Times. Description: Mr. and Mrs. Frank Lloyd Wright arrive at the Hotel Sherman for a dinner in Wright�s honor the evening of October 17, 1956. 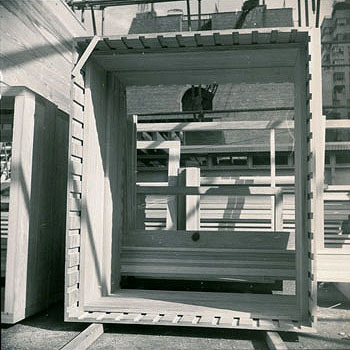 "Sixty Years of Living Architecture" was exhibited in Chicago from October 16, 17 and 18, 1956 at the Hotel Sherman, Chicago. Mayor Daley proclaimed October 17, Frank Lloyd Wright Day. Details of the mammoth structure were explained by Wright at a dinner in his honor Wednesday evening at the Hotel Sherman. The dinner was sponsored by the Frank Lloyd Wright Endowment Fund for the perpetuation of Taliesin. Wright was the guest of honor. 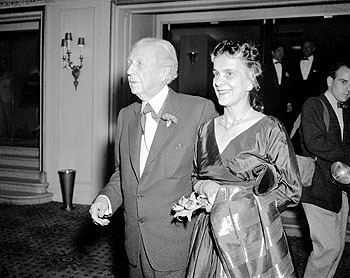 Caption reads: "Frank Lloyd Wright with wife at Sherman Hotel Oct 17 1956." Description: Wright and Mayor Richard Daley at Sherman Hotel. Oct 17 1956. 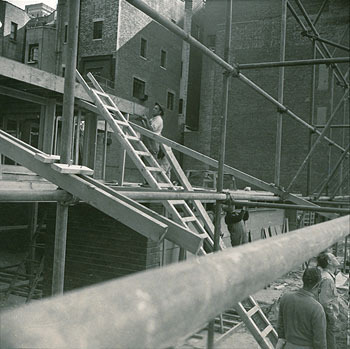 "Sixty Years of Living Architecture" was exhibited in Chicago from October 16, 17 and 18, 1956 at the Hotel Sherman, Chicago. Mayor Daley proclaimed October 17, Frank Lloyd Wright Day. Details of the mammoth structure were explained by Wright at a dinner in his honor Wednesday evening at the Hotel Sherman. The dinner was sponsored by the Frank Lloyd Wright Endowment Fund for the perpetuation of Taliesin. Wright was the guest of honor. Caption reads: "Frank Lloyd Wright explaining architecture to honorable guest Mayor Richard Daley at Sherman Hotel. Oct 17 1956." Description: Wright and Mayor Richard Daley at Sherman Hotel. Photograph taken from a lower angle looking up. Wright is gesturing with his hand, Daley is listening to Wright. Oct 17 1956. 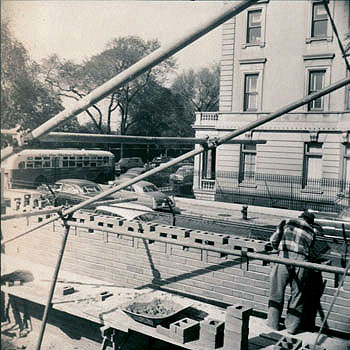 "Sixty Years of Living Architecture" was exhibited in Chicago from October 16, 17 and 18, 1956 at the Hotel Sherman, Chicago. Mayor Daley proclaimed October 17, Frank Lloyd Wright Day. Details of the mammoth structure were explained by Wright at a dinner in his honor Wednesday evening at the Hotel Sherman. The dinner was sponsored by the Frank Lloyd Wright Endowment Fund for the perpetuation of Taliesin. Wright was the guest of honor. Label pasted on verso: "Chicago Sun-Times. Date: 10/17/56. Photographer: Mel Larson. Location: Sherman Hotel. 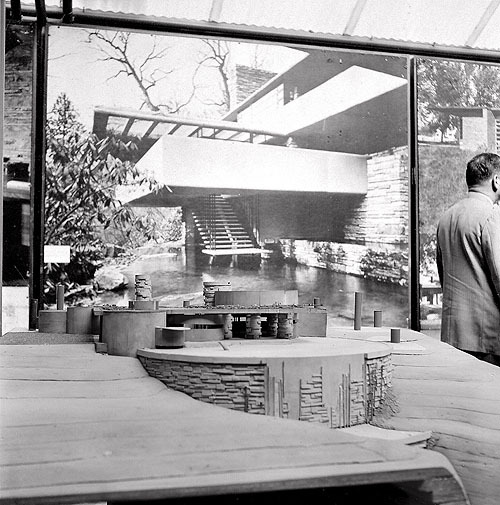 Caption: Candids on Frank Lloyd Wright explaining architecture to honorable guest Mayor Richard Dailey." Caption pasted on verso: "Mr. Wright speaks, Mr. Daley Listens. 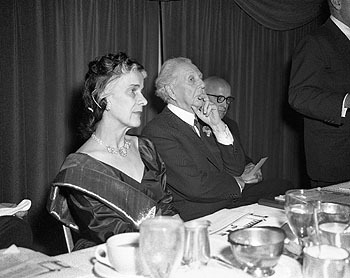 Frank Lloyd Wright (left) engages in an animated discourse at testimonial dinner in his honor at Hotel Sherman. Famed architect admits that the speakers who referred to him as a genius were speaking the truth. But when Wright begins to discuss his proposed mile-high building, Mayor Daley (right) doesn�t seem to fully accept the idea. 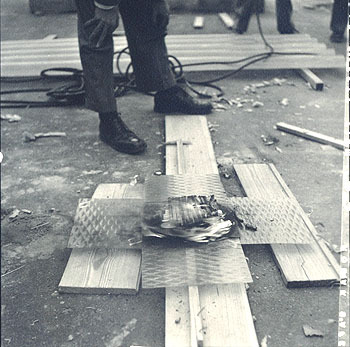 The controversial 87-year-old Wright was glum about modern architectural trends. 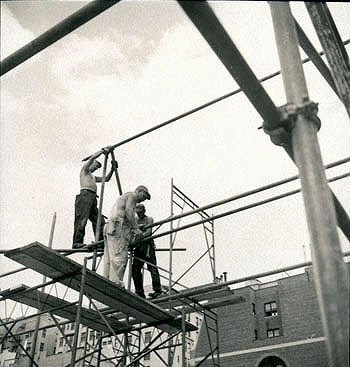 Photos by Mel Larson." Description: Wright and Mayor Richard Daley at Sherman Hotel. 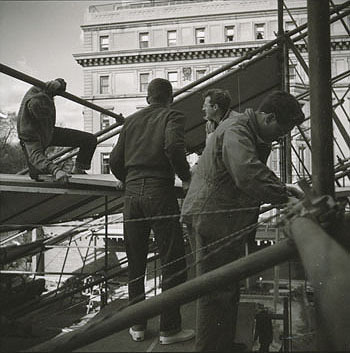 Photograph taken from a higher angle looking down. Wright is gesturing with his hand, his fist is balled for emphasis, Daley is listening to Wright. Oct 17 1956. 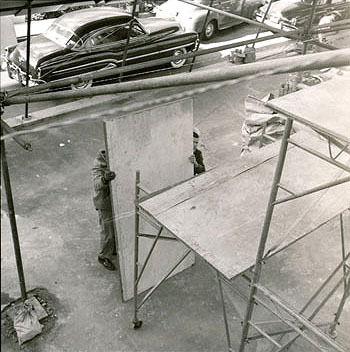 "Sixty Years of Living Architecture" was exhibited in Chicago from October 16, 17 and 18, 1956 at the Hotel Sherman, Chicago. Mayor Daley proclaimed October 17, Frank Lloyd Wright Day. Details of the mammoth structure were explained by Wright at a dinner in his honor Wednesday evening at the Hotel Sherman. The dinner was sponsored by the Frank Lloyd Wright Endowment Fund for the perpetuation of Taliesin. Wright was the guest of honor. Caption reads: "Frank Lloyd Wright explaining architecture to honorable guest Mayor Richard Daley at Sherman Hotel. Oct 17 1956." Description: Wright and Mayor Richard Daley at Sherman Hotel. Wright has an envelope in his hands. Both he and Daley are looking up at the display. Oct 17 1956. 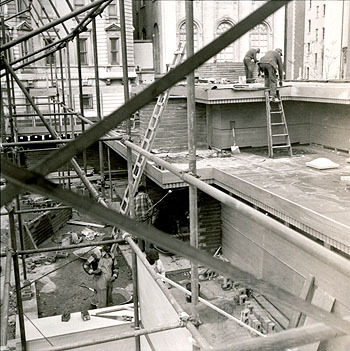 "Sixty Years of Living Architecture" was exhibited in Chicago from October 16, 17 and 18, 1956 at the Hotel Sherman, Chicago. Mayor Daley proclaimed October 17, Frank Lloyd Wright Day. Details of the mammoth structure were explained by Wright at a dinner in his honor Wednesday evening at the Hotel Sherman. The dinner was sponsored by the Frank Lloyd Wright Endowment Fund for the perpetuation of Taliesin. Wright was the guest of honor. 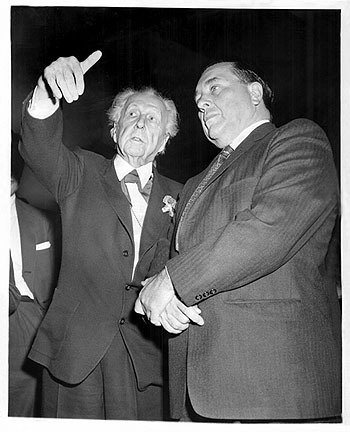 Caption reads: "Frank Lloyd Wright explaining architecture to honorable guest Mayor Richard Daley at Sherman Hotel. Oct 17 1956." Description: Wright greeting guests before dinner at the Sherman Hotel. Oct 17 1956. 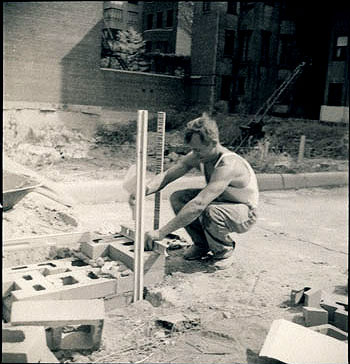 "Sixty Years of Living Architecture" was exhibited in Chicago from October 16, 17 and 18, 1956 at the Hotel Sherman, Chicago. Mayor Daley proclaimed October 17, Frank Lloyd Wright Day. Details of the mammoth structure were explained by Wright at a dinner in his honor Wednesday evening at the Hotel Sherman. The dinner was sponsored by the Frank Lloyd Wright Endowment Fund for the perpetuation of Taliesin. Wright was the guest of honor. 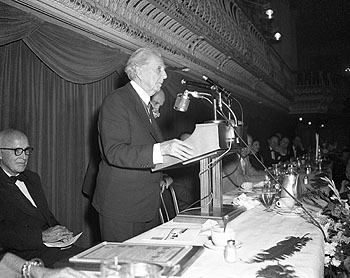 Caption reads: "Frank Lloyd Wright making speech on architecture at Sherman Hotel Oct 17 1956." Description: Mr. & Mrs. Wright seated at speakers table before dinner. Mrs. Maginel Wright Barney, Wright�s sister and children�s book illustrator, congratulates Wright with a kiss on the cheek. Oct 17 1956. 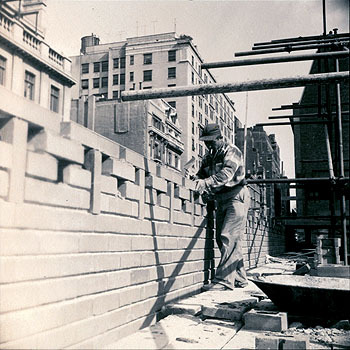 "Sixty Years of Living Architecture" was exhibited in Chicago from October 16, 17 and 18, 1956 at the Hotel Sherman, Chicago. Mayor Daley proclaimed October 17, Frank Lloyd Wright Day. Details of the mammoth structure were explained by Wright at a dinner in his honor Wednesday evening at the Hotel Sherman. The dinner was sponsored by the Frank Lloyd Wright Endowment Fund for the perpetuation of Taliesin. Wright was the guest of honor. Label pasted on verso: "Chicago Sun-Times. Date: 10/17/56. Photographer: Mel Larson. Location: Sherman Hotel. Names L. to R.: Mrs. Wright. 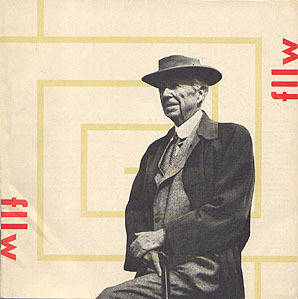 Frank Lloyd Wright. Mrs. Magda Barney of New York City. 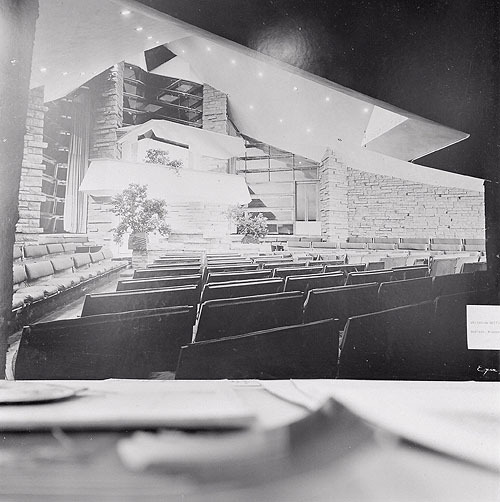 Caption: Mrs. Barney Frank Lloyd Wright� sister plants kiss on his cheek at speakers table." 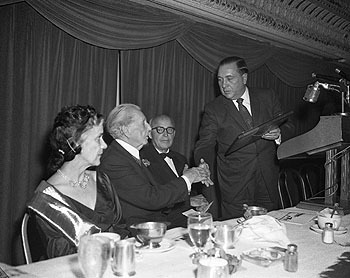 Description: Frank Lloyd Wright is presented a plaque by Mayor Daley declaring this day to be "Frank Lloyd Wright Day" at the Sherman Hotel. Mrs. Wright is on the left, Ludd M. Spivey, President of Florida Southern College is seated, between Wright and Daley. Two exhibition catalogs sit on the table. Oct 17 1956. 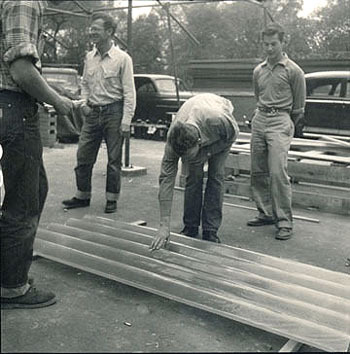 "Sixty Years of Living Architecture" was exhibited in Chicago from October 16, 17 and 18, 1956 at the Hotel Sherman, Chicago. Mayor Daley proclaimed October 17, Frank Lloyd Wright Day. Details of the mammoth structure were explained by Wright at a dinner in his honor Wednesday evening at the Hotel Sherman. The dinner was sponsored by the Frank Lloyd Wright Endowment Fund for the perpetuation of Taliesin. Wright was the guest of honor. 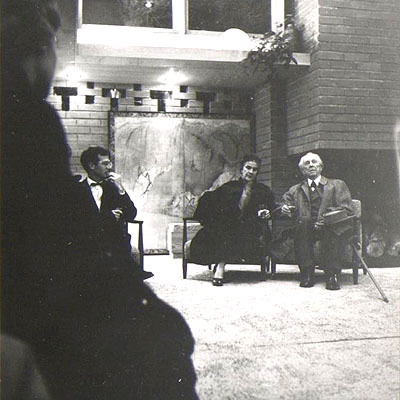 Caption reads: "Frank Lloyd Wright & Wife 1956. 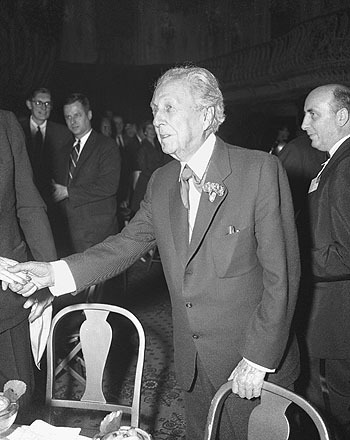 Frank Lloyd Wright and his wife at a special ceremony where he was presented a plaque by Mayor Daley declaring this day to be �Frank Lloyd Wright Day� October 17, 1956." Description: Wright listens to introductions. Mrs. Wright is seated on the left, Ludd M. Spivey, President of Florida Southern College is seated on the right waiting to speak. 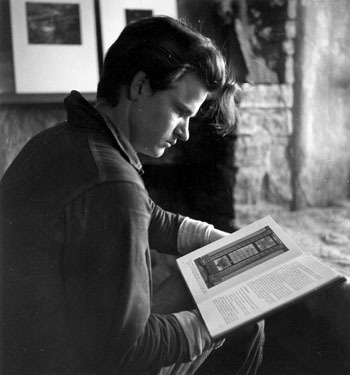 Exhibition catalog and plaque sit on the table in front of him. Oct 17 1956. 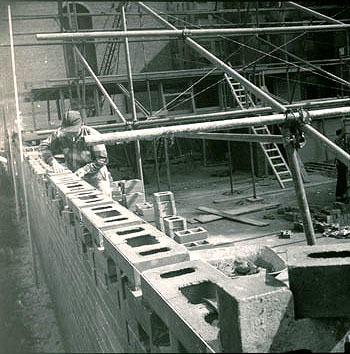 "Sixty Years of Living Architecture" was exhibited in Chicago from October 16, 17 and 18, 1956 at the Hotel Sherman, Chicago. Mayor Daley proclaimed October 17, Frank Lloyd Wright Day. Details of the mammoth structure were explained by Wright at a dinner in his honor Wednesday evening at the Hotel Sherman. The dinner was sponsored by the Frank Lloyd Wright Endowment Fund for the perpetuation of Taliesin. Wright was the guest of honor. 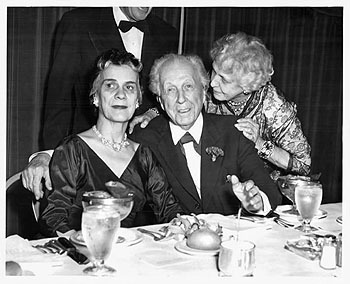 Caption reads: "Frank Lloyd Wright with wife at Sherman Hotel Oct 17 1956." Description: Wright speaks at Sherman Hotel Oct 17 1956. 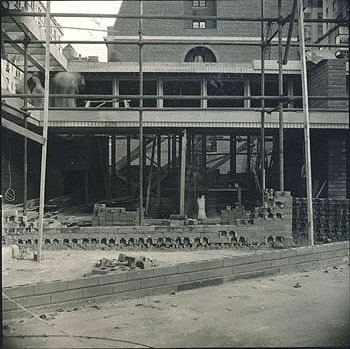 Wright describes the details of the Mile-High "Illinois" building at a dinner in his honor Wednesday evening at the Hotel Sherman. Ludd M. Spivey, President of Florida Southern College is seated on the left. Exhibition catalog and plaque sit on the table. Oct 17 1956. 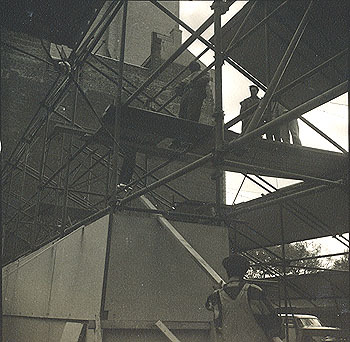 "Sixty Years of Living Architecture" was exhibited in Chicago from October 16, 17 and 18, 1956 at the Hotel Sherman, Chicago. Mayor Daley proclaimed October 17, Frank Lloyd Wright Day. Details of the mammoth structure were explained by Wright at a dinner in his honor Wednesday evening at the Hotel Sherman. The dinner was sponsored by the Frank Lloyd Wright Endowment Fund for the perpetuation of Taliesin. Wright was the guest of honor. 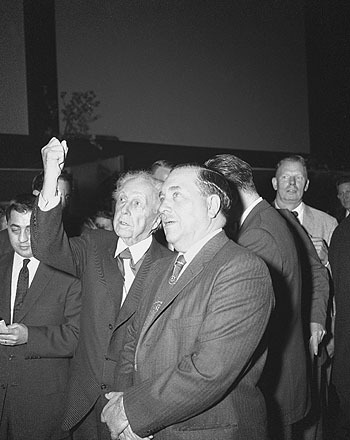 Caption reads: "Frank Lloyd Wright making speech on architecture at Sherman Hotel Oct 17 1956." Description: Wright shakes Mayor Richard Daley�s hand and speaks with he and Mayor Ivan Nestigan after dinner at the Sherman Hotel Oct 17 1956. 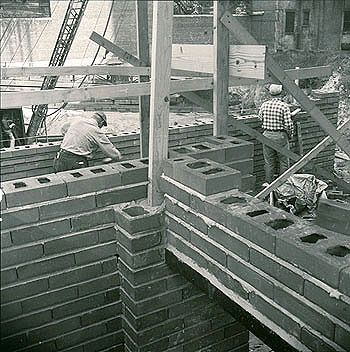 "Sixty Years of Living Architecture" was exhibited in Chicago from October 16, 17 and 18, 1956 at the Hotel Sherman, Chicago. Mayor Daley proclaimed October 17, Frank Lloyd Wright Day. Details of the mammoth structure were explained by Wright at a dinner in his honor Wednesday evening at the Hotel Sherman. The dinner was sponsored by the Frank Lloyd Wright Endowment Fund for the perpetuation of Taliesin. Wright was the guest of honor. 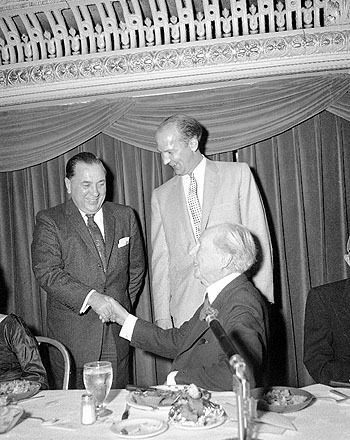 Caption reads: "Frank Lloyd Wright, meets some of honored guests, Mayor Richard Daley and Mayor Ivan Nestigan, of Madison Wis. at Sherman Hotel. Oct 17 1956." Description: Wright speaks with Mayor Richard Daley and Mayor Ivan Nestigan after dinner at the Sherman Hotel. Mrs. Wright is seated on the left. Oct 17 1956. 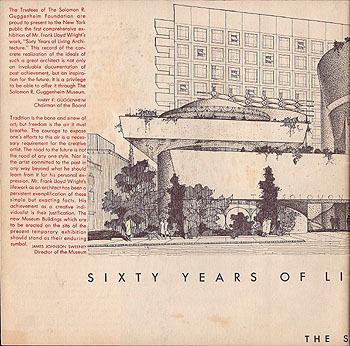 "Sixty Years of Living Architecture" was exhibited in Chicago from October 16, 17 and 18, 1956 at the Hotel Sherman, Chicago. Mayor Daley proclaimed October 17, Frank Lloyd Wright Day. Details of the mammoth structure were explained by Wright at a dinner in his honor Wednesday evening at the Hotel Sherman. The dinner was sponsored by the Frank Lloyd Wright Endowment Fund for the perpetuation of Taliesin. Wright was the guest of honor. 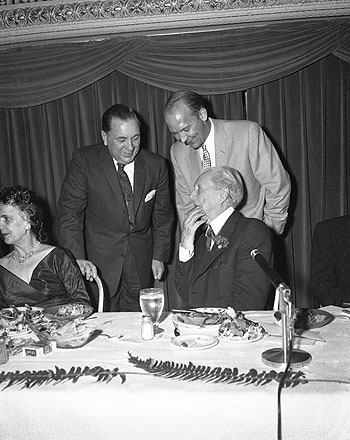 Caption reads: "Frank Lloyd Wright with wife and Mayor Richard Daley at Sherman Hotel Oct 17 1956." 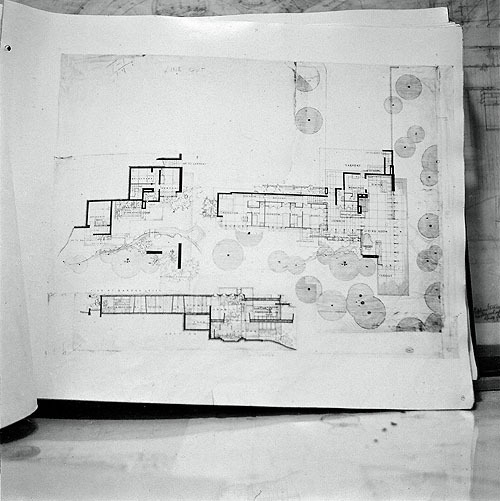 Title: Frank Lloyd Wright Day, October 17, 1956. Package promoting FLW Day. Description: 1) Promotional Brochure. 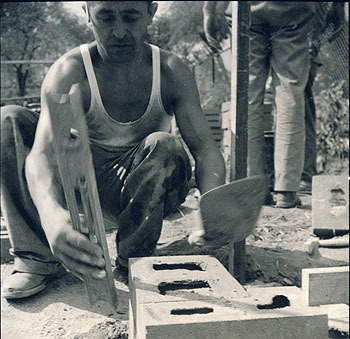 "You are invited to participate in Frank Lloyd Wright Day. 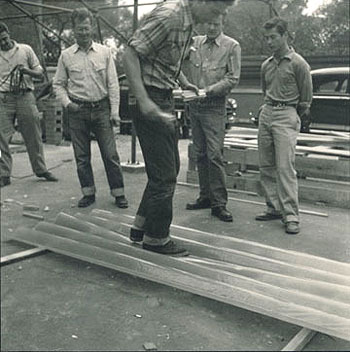 Mr. Frank Lloyd Wright will unveil details of his history-making mile-high cloud-scraper, the �Illinois�, at a dinner on Wednesday, October 17, 1956. A special list of sponsors has been drawn up which includes your name among the select few who have been invited to attend. 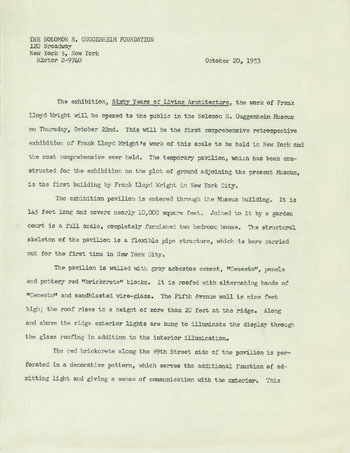 Mayor Richard J. Daley has officially proclaimed this date as Frank Lloyd Wright Day In Chicago, and his official proclamation is reproduced herein. 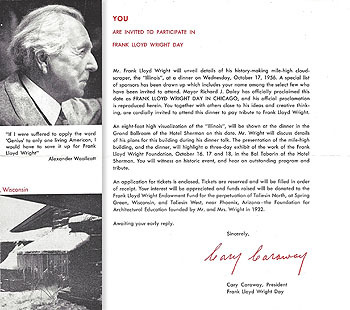 You together with others close to his ideas and creative thinking, are cordially invited to attend this dinner to pay tribute to Frank Lloyd Wright... Cary Caraway, President, Frank Lloyd Wright Day." Back: "Honors awarded Frank Lloyd Wright." Package acquired from the estate of Cary Caraway. 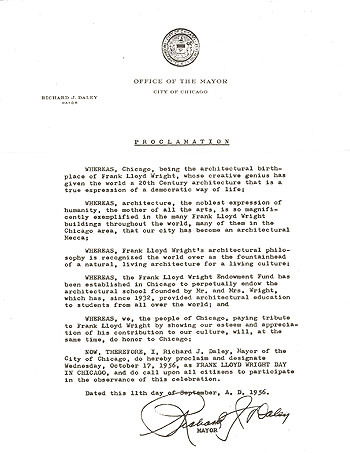 Description: 2) Proclamation of Frank Lloyd Wright Day by Mayor Richard Daley. "Whereas, Chicago, being the architectural birthplace of Frank Lloyd Wright, whose creative genius has given the world a 20th Century architecture that is a true expression of a democratic way of life; Whereas, architecture, the noblest expression of humanity, the mother of all the arts, is so magnificently exemplified in the many Frank Lloyd Wright building... Now, Therefore, I, Richard J. Daley, Mayor of the City of Chicago, do hereby proclaim and designate Wednesday, October 17, 1956, as Frank Lloyd Wright Day in Chicago..."
Description: 3) Invitation and order form. Description: 4) Return envelope. 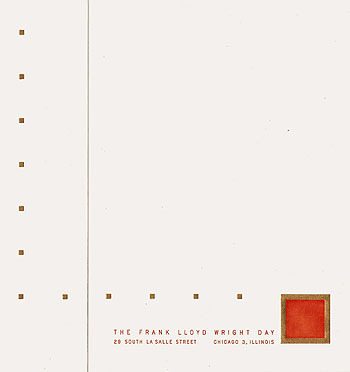 "The Frank Lloyd Wright Day, 29 South La Salle Street, Chicago 3, Illinois." Printed on watermarked beige paper, "Lakeside Bond, Cockle Finish, Cotton Fibre Content." Stamped. Description: 5) Mailing Envelope. 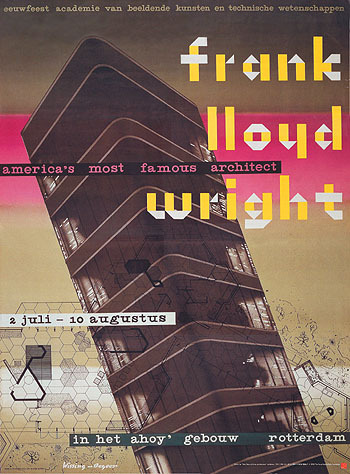 "The Frank Lloyd Wright Day, 29 South La Salle Street, Chicago 3, Illinois." Red text. Printed on watermarked beige paper, "Lakeside Bond, Cockle Finish, Cotton Fibre Content." Note, text matches text on letterhead. Package acquired from the estate of Cary Caraway. Size: No. 10, 9.5 x 4.1. 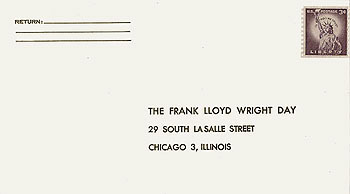 Title: Frank Lloyd Wright Day Letterhead. 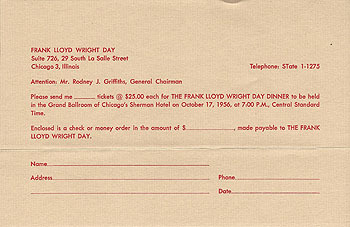 Description: "The Frank Lloyd Wright Day, 29 South La Salle Street, Chicago 3, Illinois." Red text. The front is printed in red (raised) ink, embossed and gilt or gold ink. Red text and red square is printed in a precise red raised ink. The four squares are embossed (raised) then printed in gilt or gold ink. The gold square border is the same process as the small gold squares. The back has eight small gold squares, embossed and printed in gilt or gold ink. The fold is scored. It is designed for the left two inches of the page to be folded over to complete the design. Printed on watermarked beige paper, "Lakeside Bond, Cockle Finish, Cotton Fibre Content." Note, text matches text on envelope. Acquired from the estate of Cary Caraway. Size: 10 x 8.5 folds to 8 x 8.5. Elevan sheets. 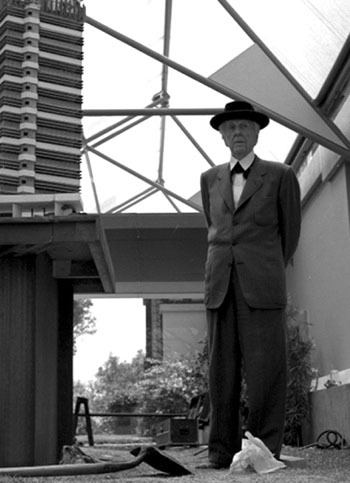 Cary Caraway was president of the Frank Lloyd Wright Day. Jesse Claude (Cary) and Frances Caraway, were both Taliesin apprentices in the 1930/40s. 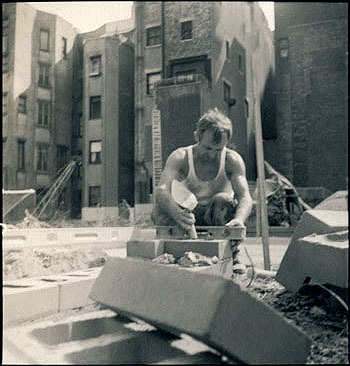 Cary was an apprentice from 1935-1942. 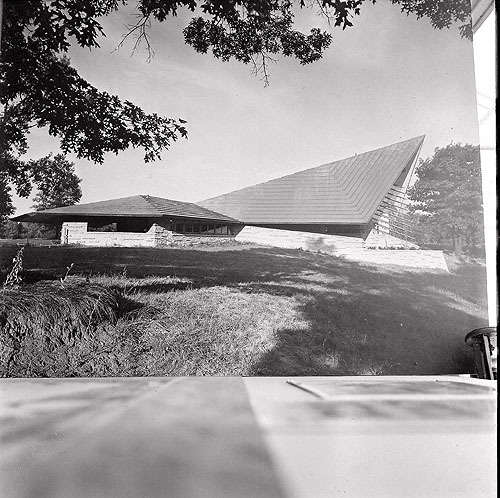 In 1954 the Wisconsin Supreme Court ruled that Wright owed $10,000 in back taxes on Taliesin. For years he had argued that Taliesin was primarily a school and therefore tax exempt. He was so mad he threatened to destroy Taliesin and move from the state. Cary Caraway, suggested that Wright�s friends express their appreciation and take up a collection. Mary Lescohier and Helen Groves made it happen. 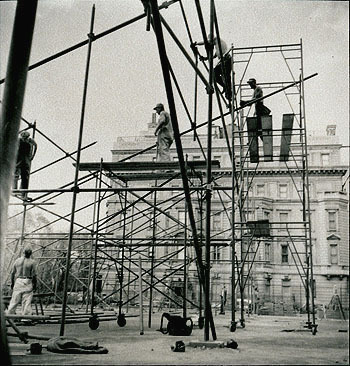 On February 10, 1955, 380 supporters gathered in the Great Hall of the U.W. Memorial Union for a tribute, the Monona Terrace Testimonial Banquet. 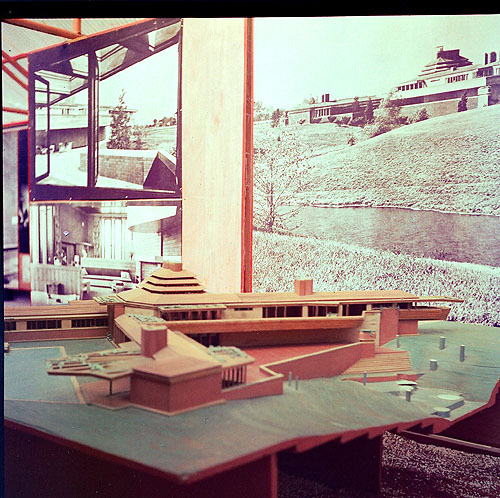 Wright took the opportunity to display the new Monona Terrace model. At the end of the program, he received a check for $10.000. Apprentice Cary Caroway reading a book on architecture. 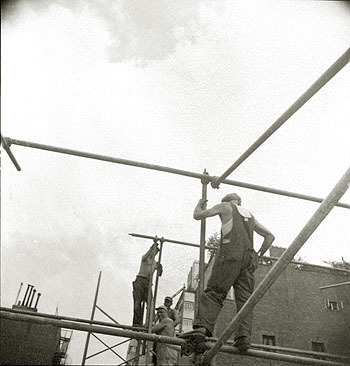 Photograph by Edmund Teske, 1936. Courtesy of The Frank Lloyd Wright Foundation. Description: On face of illustration: "The Illinois. 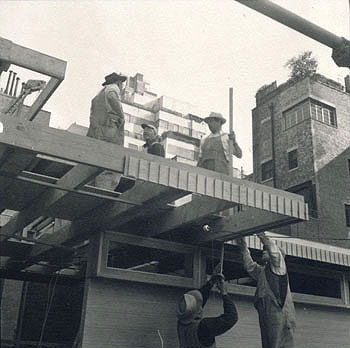 Cantilever - Structure. Mile High. 528 Stories or 5280 Feet + 400-Foot Aerial. Frank Lloyd Wright, Architect." 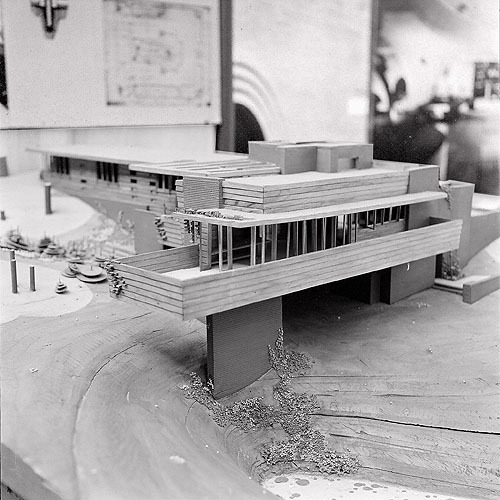 Frank Lloyd Wright Project: "Mile High" ("The Illinois") Office Building, Chicago, Illinois, 1956. 24 x 96". 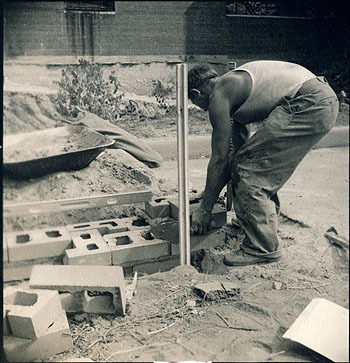 Copyright � The Frank Lloyd Wright Foundation 1957. GA Drawings No.6, Copyright � A.D.A. Edita Tokyo Co., Ltd. 1989. 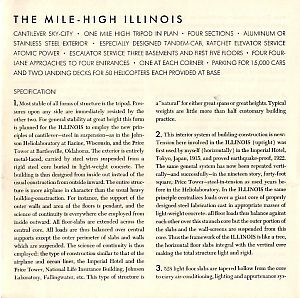 Title: Mile High Building, The "Illinois", (Project 1956), 2007 Edition. Description: The Illinois was 528 stories tall, could hold 100,000 people and would cost about $100 million. The floors extending outward from a central. Model is hand cast in cold cast bronze, 4 oz. of bronze powder set in resin and hand polished. 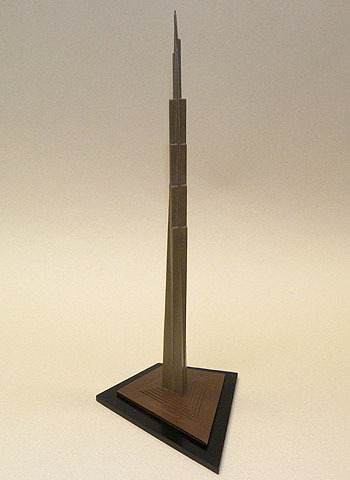 Inscribed in the base: "Frank Lloyd Wright 1956, Mile High Illinois, Unbuilt Project, Jon Bell Model, 1989, 2007 Edition." Size: 11" high, 1" = 500' scale.